This page is set aside for discussion of the preferential treatment being given to the Black Panthers by the Obama Justice Department, under the feckless leadership of Attorney General Eric Holder. At the center of the controversy is [quoting Fox News] "an incident at a Philadelphia polling place on Election Day 2008 when three members of the party were accused of trying to threaten voters and block poll and campaign workers by the threat of force — one even brandishing what prosecutors call a deadly weapon." The material below is presented as a public service for the benefit of people who who get all their information from television news, late night comedians, labor unions, and the "talking points" spread at the office by left-wing activists. Promoting The Black Panthers. [Scroll down] At the celebration of the Panthers in Sacramento's Oak Park, "Children raised their right fists and shouted, 'black power!'" and college students thanked [Bobby] Seale, "for instilling black pride and empowerment in their predecessors in the turbulent '60s." The Black Panthers, the [Sacramento] Bee explains, "patrolled Oakland's black neighborhoods to protect residents fearful of police brutality. The Rev. Martin Luther King Jr.'s assassination 18 months later galvanized black youths across America to start or join Panther chapters." The group's 10-point program "called for full employment, better housing and radical ideas such as exempting black men from the Vietnam War. Those goals inspired social programs, including free breakfasts for inner-city kids, free health screenings, ambulance services and dental care." The Top 5 Investigations Obstructed by the Obama Administration. [#5] The investigation of the New Black Panther Party voter intimidation: You may remember images and video from Election Day 2008, with members of the New Black Panther Party standing outside a Philadelphia polling place wearing military garb making racial remarks and discouraging people from voting. A voter intimidation case against the New Black Panthers began weeks before Obama took office. It was an open-and-shut case, and the New Black Panthers didn't even show up in court to defend themselves, assuring the government's victory in the case. Then in May 2009, the case was inexplicably dropped by Attorney General Eric Holder. When the U.S. Commission on Civil Rights investigated, the Obama administration refused to respond to requests from the commission and Congress. Federal attorneys were instructed not to cooperate with the investigation and then-Assistant Attorney General for Civil Rights Tom Perez (the current chairman of the Democratic National Committee) lied under oath about who was involved in the decision to drop the case. Black Panther Members Breach Security at Virginia Elementary School to Stage Protest. A group of protesters identifying as members of the Black Panther Party protested inside a Virginia, elementary school Friday [3/1/2019], according to the Loudoun County Sheriff's Office (LCSO). The group apparently sneaked inside behind a parent and student who had been buzzed into the school entrance, LCSO said in a Facebook post to the community. A staffer at Madison's Trust Elementary School called 911 Friday morning to report that people were "possibly being disorderly" inside the school's office, according to the post. New Attorney General Needs To Clean House. The liberal direction of the DOJ is nothing new. In the Obama administration, then Attorney General Eric Holder was a liberal activist instead of the nation's top law enforcement officer. Holder infamously labeled America "a nation of cowards" for not having the courage to discuss race relations. Thereafter, he spent his entire tenure obsessively focused on race. It was certainly a questionable decision when his department decided not to prosecute members of the Black Panthers who were threatening voters and armed with a weapon at a precinct in Philadelphia. He made sure that no investigations ever touched President Obama, since he promised to be his "wing man." Former Black Panther, in prison for 47 years, denied release for the ninth time. Jalil Muntaqim, a former Black Panther who has been in prison for 47 years, has been told he must spend at least another 15 months behind bars having been denied release for the ninth time by a New York state parole board. The three-member parole panel voted this week by two-to-one to keep Muntaqim, AKA Anthony Bottom, incarcerated in the maximum-security Sullivan correctional facility in upstate New York. His release had been vociferously opposed by the New York City police unions and by the widow of one of the two police officers he was convicted of murdering in 1971. 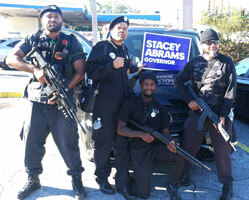 Black Panthers armed with assault rifles campaign for Stacey Abrams; one problem. Members of the Black Panther Party marched through the city of Atlanta, strapped with assault rifles and brandishing Stacey Abrams campaign signs. In a video posted on the group's Facebook page on Saturday [11/3/2018], members of the group can be seen marching through the West End neighborhood of Atlanta in support of Abrams's gubernatorial campaign. As they march, they carry assault rifles and continually shout slogans such as "black power" and "power to the people." The video shows the members marching for nearly 30 minutes until they enter a local radio station. 'Fact Checkers' at Snopes Attempt to Bail Out Stacey Abrams from Armed Black Panthers Story. The so-called "fact checkers" at Snopes have reached out to Breitbart News in an openly partisan attempt to wash away the story of armed members of the New Black Panther Party campaigning for the Democrat gubernatorial candidate in Georgia, Stacey Abrams. Over the weekend, Breitbart News — among other media outlets — published explosive photographs of armed Black Panthers campaigning for Abrams, holding up her campaign sign while also holding up various guns. In the story, Breitbart News included a quote from the campaign of her GOP opponent, Brian Kemp, calling on her to denounce the radicals campaigning for her. Armed Black Panthers: Voter Intimidation in Georgia. Where are the cries of "voter intimidation" from Leftists? If you think Leftists care about voter suppression or intimidation, then you likely watch fake news. Look at these members of the New Black Panther Party. They campaign for GA gubernatorial candidate Stacy Abrams. I don't know many people who would consider this group to lead their voter registration drive, but then again, I'm not a Democrat. Armed Black Panthers Lobby for Democrat Gubernatorial Candidate Stacey Abrams. Breitbart News has obtained photographs of members of the New Black Panther Party wielding weapons and holding signs supporting Democrat gubernatorial candidate Stacey Abrams, a leftist who hopes to be the first black female governor in Georgia. This comes on the heels of Oprah Winfrey's visit to the state on Abrams behalf where she said the Democrat refuses to allow the sacrifices of those who were "lynched" and "oppressed" to be "in vain." 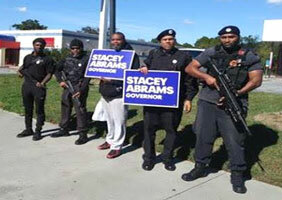 Armed With Assault Rifles, Black Panthers March for Stacey Abrams. Members of the Black Panther Party marched through the city of Atlanta, strapped with assault rifles and brandishing Stacey Abrams campaign signs. In a video posted on the group's Facebook page on Saturday, members of the Black Panther Party are seen marching through the West End neighborhood of Atlanta in support of Stacey Abrams gubernatorial campaign. As they marched, the Black Panthers carried assault rifles and continually shouted slogans such as "black power" and "power to the people." Black Panthers with Loaded Weapons Disarmed by Tactical Officers on Steps of NC Courthouse. On Sunday [1/29/2017], the Revolutionary Black Panther Party held a press conference in North Carolina, according to NBC's WECT 6. The group had all the normal trappings of a press conference as the members stood on the steps of the New Hanover County Courthouse. They brought a microphone. And, read from talking points. However, the Black Panther group added a unique — and illegal — element to its press conference: firearms. Eric Holder as President? Eric Holder has decided to run for president to complete the work of converting America to an openly recognized communist country. But, he has a few things to answer for before he takes control of the entire law enforcement apparatus of the United States and begins his war on whites. If you recall, he refused to arrest the Black Panthers standing outside of a voting center when Barack Obama was elected. It was obvious voter intimidation, but by claiming that worse had been done to "his" people, he would not prosecute. New Black Panther Party Demanding Their Own Country Within The United States. The militant New Black Panther Party, with members who have been calling for a race war within the United States, with leaders who have posted a $10,000 bounty on George Zimmerman's head, and with bosses who stood accused of voter intimidation against white people trying to vote in 2008, is segregation in the U.S. The investigation into voter intimidation was opened under the administration of George W. Bush, with reports that one of the defendants, Minister King Samir Shabazz, was wielding a billy club and allegedly telling voters, "You're about to be ruled by the black man, cracker." Berkeley receives $100K to 'honor the legacy' of the Black Panther Party. The radical Marxist revolutionary organization from the 1960s, the Black Panthers, will be the subject of an academic study conducted by the University of California-Berkeley to discover and honor the group's legacy. The study is being funded by the American taxpayer via a grant for about $100,000 from, curiously, the National Park Service. Americans Affirm Voter ID Laws. Contrary to claims of opponents, minority voter participation has increased in states with photo ID laws. Nonetheless, President Obama's Department of Justice, the ACLU, and a host of leftist organizations continue their crusade against photo ID laws, which they liken to images of KKK thugs with billy clubs menacing a polling place in Dixie, circa 1960. But when it came to billy-club-armed New Black Panthers menacing a Philadelphia precinct in 2008, not to worry. Obama's DOJ dismissed the voter-intimidation case against the Panthers in 2009, as recounted by J. Christian Adams, one of the DOJ attorneys who prosecuted the case and resigned in protest when it was dismissed. As an aside, catch the irony when the Panther with a billy club asks a reporter for his ID. Felony charges awaiting hundreds of Inauguration Day violent rioters. For the last 8 years leftist thugs have gotten a pass. Early on in the Obama administration, New Black Panther storm troopers — the label is fitting because they were decked out in ominous uniforms — stood before a polling station, weapons at hand, an obvious effort at voter intimidation that drew no official action from Eric Holder's Justice Department. In effect, open season was declared by the chief law enforcement officer of the United States, and the message was received by progressives. Megyn Kelly Battles Ex-New Black Panthers Leader Who Says 'Your Attitude' Is the Problem. Megyn Kelly battled the National President of Black Lawyers for Justice and former New Black Panthers leader tonight over his controversial thoughts on recent police shootings. Kelly challenged Malik Shabazz for allegedly offering sympathetic words for a police shooter, which he denied. He brought up Ferguson and they started clashing as Kelly insisted that he's completely rejecting the facts of what happened. Shabazz told Kelly, "Your attitude is part of the problem." He said that "white privilege" comes with the idea that "you believe that your lives are better than ours." New Black Panthers Declare War In Milwaukee. [Scroll down] You can't watch "Training Day" and come away with any other conclusion than it is a New Black Panther call for a revolution, beginning with a war on America's police forces. So the Milwaukee "riot" and the Dallas attack that killed 5 police officers should be seen for what it is, and it was not an impulse-driven reaction to police shootings of African-Americans in Milwaukee, Louisiana and Minnesota, but part of a carefully choreographed wave of terrorist violence intended to influence the political outcome of this election. Don't believe us? The "rioters" showed up in "riot gear" ready to rumble according to reports in the UK's Daily Mail. But let's be clear — it wouldn't matter whether Donald Trump or Jeb Bush was leading the Republican field — a summer of radical Leftist violence is coming, and it was planning, building and organizing long before Trump became the Republican nominee for President. Exclusive: New Black Panther Party says to carry arms in Cleveland if legal. The New Black Panther Party, a "black power" movement, will carry firearms for self-defense during rallies in Cleveland ahead of next week's Republican convention, if allowed under Ohio law, the group's chairman said. The plan by the group this weekend comes as police in Cleveland brace for an influx of groups that plan demonstrations before and during the presidential nominating convention. During the attack last week in Dallas that killed five police officers, law enforcement officials said demonstrators carrying rifles led them to initially believe they were under attack by multiple shooters. Black Panthers Will Carry Weapons in Cleveland GOP Convention. The New Black Panther Party, a "black power" movement, will carry firearms for self-defense during demonstrations in Cleveland ahead of next week's Republican convention if allowed under Ohio law, the group's chairman said. The plan by the group could add to security headaches for the Ohio city after last week's killing of five police officers in Dallas by a U.S. army veteran who had been drawn to black separatist ideology, including on Facebook, before hatching his plan to target white police officers. Exclusive — New Black Panther Leader: Blacks Need to Migrate to Five Southern States, Form 'Country Within a Country'. Babu Omowale, the so-called national minister of defense for the People's New Black Panther Party, says his group and allied organizations have their sights set on establishing "our own government in a nation within a nation." Omowale was speaking in an interview set to air Sunday night on this reporter's talk radio program, "Aaron Klein Investigative Radio," broadcast on New York's AM 970 The Answer and News Talk 990 AM in Philadelphia. Omowale used the interview to claim five states as belonging to the "Black Nation": Louisiana, Mississippi, South Carolina, Alabama, and Georgia. Obama Justice Department Laughed Off Armed New Black Panther Threat. In 2009 and 2010, lawyers working at the United States Justice Department warned top Obama political appointees and other Justice Department officials about the dangerous threats of New Black Panthers to kill police officers and other whites. I was one of those lawyers who delivered those warnings. Our warnings came in the context of the Voting Rights Act case I and other lawyers brought against the New Black Panthers on behalf of the United States in 2009, a case the Obama administration ultimately abandoned. Both top DOJ officials, including now Labor Secretary Tom Perez, as well as rank and file employees in the Civil Rights Division, were warned but did not take the New Black Panther threat seriously or otherwise considered the organization to be a laughable joke. Allies in the media echoed the narrative that the defendants in the voter intimidation case were harmless clowns. Black against White. When the New Black Panther Party intimidated voters in Philadelphia, Eric Holder's justice department dropped the case. When a white police officer in Ferguson, MO shot a black man, he was exonerated by all investigations. And yet, the meme pesists: the officer was guilty of murder. And the death of Freddy Gray was declared a homicide, even if the courts have clearly said otherwise. Anything to make blacks feel victimized. Anything to make them feel justified in rioting and burning down their neighborhoods. President Obama's Potential Felonies. [Scroll down] Another type of investigation sabotaged by Obama's Dept. of Justice was the investigation of a Black Panther member who aggressively and willfully intimidated voters at a polling place in Philadelphia in 2008. The Obama Administration let the Black Panther member off the hook in 2008 but the leader of that Black Panther chapter, King Samir Shabazz, got arrested on gun charges in 2013. With the Obama Administration's obsession with guns one would expect them to take these charges very seriously. Previously, King Shabazz had uttered numerous comments that were hate speech when he stated that he wanted his followers to raid nurseries and "kill everything white in sight." He also recommended that "black people should create militias to exterminate whites, skin them alive, pour acid on them, sick pit bulls on them, bust their heads with rocks...." Only when he was found in New York City to be carrying an unlicensed gun was any law enforcement action done against him. So while these actions by the Obama Administration may appear to be purely political they are also violations of Title 18 laws regarding the conduct of Federal officials in the handling of investigations. Super Bowl Halftime Show Was Black Version of KKK Rally. The Black Panthers weren't just lunatic moonbats who hated white people. They were also violent sociopaths who engaged in a wide array of crimes including murder. Judging by their rhetoric, the New Black Panthers aren't any better. [...] Malcolm X was best known for rejecting the peaceful tactics advocated by MLK in favor of his "by any means necessary" approach to achieving black power. [...] Why can't regular Americans even watch a football game without being told to hate themselves for their race? The Black Panthers are back — and never really went away. The Panthers were more than militants; they were pioneers in American pop and political culture. The Black Lives Matter movement, the rise of social media, music and sports, even Donald Trump — all were shaped by the Panthers in some way, historians and ex-Panthers say. On the 50th anniversary of the founding of the Black Panther Party, people are taking a second look at the group. A mesmerizing new film, "Black Panthers: Vanguard of the Revolution," airs on PBS throughout this month and appears online. And Beyonce's tribute caused people to post vintage photos of the Panthers on social media sites and debate the group's purpose. A Short History of Leftist Violence. The Black Panthers were violent, anti-Semitic, misogynist, racist, militaristic, etc. Yet white middle-class students — and many others in the US and UK — have always been titillated by them. This inverted-racist tradition goes back a long time. It shows itself in the love of black violence and the hatred of — and opposition to — "white violence". [...] Malcolm X famously told his fellow blacks to employ "any means necessary" to destroy the "white oppressor". New Black Panthers with Guns, Lots of Them. This week President Obama announced legally dubious plans to force private citizens to behave as if they were federal gun dealers and threatened to place the names of certain Americans on a list to prevent them from obtaining firearms. He sought to expand background checks to gun transactions that Congress has long exempted from federal interference. President Obama claimed he was very concerned about the wrong people having guns. He wasn't always so concerned about the wrong people having guns. Voter Fraud: We See Dead People. Remember the Black Panther Party thugs who stood outside the polls armed with clubs? Though they were charged with voter intimidation, Obama's DOJ arrogantly and without apology outrageously dropped the charges because the perpetrators were black. Armed Black Panthers to Texas Cops: 'We Will Start Creeping Up on You in the Darkness'. Armed Black Panther members marched in front of the Waller County jail and shouted, "You're gonna stop doing what you're doing, or we will start creeping up on you in the darkness." The statement was made just two weeks prior to the assassination of a Harris County deputy sheriff. New Black Panther Party Activists Sentenced for Bomb Plot Against Ferguson Police Dept.. #BlackLivesMatter is a dangerous "movement." It is a movement centered on what the left would call "hate speech" (if it were whites saying these things) and violence. Two Black Panthers are now doing hard time for plotting to bomb the Ferguson Police Department — [an] act that they would have accomplished if only they hadn't run out of food stamp money. Whitewashing the Black Panthers. [Scroll down] A good journalist might look at the actuarial table for Panther members and wonder why more Panthers were killed by fellow black nationalists than by the pigs. Because the murder of Alex Rackley wasn't an aberration. And while the Feds undoubtedly abused their power in pursuit of the Panthers, their obsession with violent black nationalism wasn't irrational. 'Oink, oink.. bang, bang': Dozens of heavily-armed New Black Panther activists threaten Texas police. Dozens of heavily-armed Black Panthers took to the streets of Texas yesterday chanting slogans about killing police officers as they protested the death of rights activist Sandra Bland. Wielding AR-15 assault rifles, shotguns, and hunting rifles, the hard-line activists chanted slogans such as 'Off the pigs', 'Whose streets? Our streets' and 'Oink, oink... bang, bang'. The group, who said they were from the New Black Panthers movement, marched to the Waller County Jail where Bland died in police custody a month ago today. 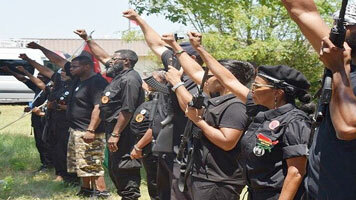 Armed Black Panthers March in Texas: 'Off the Pigs'. A group of armed members of the New Black Panther Party marched on the Waller County Jail Wednesday afternoon chanting "The revolution is on... Off the pigs," and "Oink Oink... Bang Bang!" The group of about fifteen Black Panthers exercised their First and Second Amendment rights. The group was met in Waller County by a large contingent of Harris County (Houston) Sheriff's Office deputies. New Black Panther Party Members Who Met in Ferguson Admit Planning to Kill Prosecutor, Blow Up Police Station. Two members of the New Black Panther Party who met in Ferguson during protests over Michael Brown's death admitted in court Tuesday [6/2/2015] they planned to blow up a police station and kill the prosecutor involved in the case. The St. Louis Post-Dispatch reports 23-year-old Olajuwon Ali Davis and 24-year-old Brandon Orlando Baldwin each pleaded guilty to multiple explosive and gun related charges in federal court today. Black Panther Ex-Chairman: 'Complete' Charleston's Slave Rebellion's Plan to Kill All Slave Masters. In an angry call to arms just a block away from the site of the Charleston massacre, former New Black Panther Party chairman Malik Zulu Shabazz told a group of about 200 African American Charlestonians that they need to "finish the mission" of killing "slave masters" and their families. He made the incendiary comments at the Save the Black Church rally held Tuesday night [6/23/2015] in Marian Square, close to the Mother Emanuel AME Church, where white racist Dylann Roof allegedly murdered nine black churchgoers. Black Panthers Call for Killing of Police During SXSW Armed March. Black Panthers march downtown Austin, TX during SXSW [South by Southwest, an annual event in Austin] chanting slogans supporting killing cops. This is the type of propaganda we saw in Ferguson funded by George Soros. New Black Panther Party Head: We Are 'Willing to Kill' for Black Nation. This Week on the New Black Panther Party's "Black Power Radio," national chairman Hashim Nzinga said since America has "declared war on us," evidenced by "military police in the black neighborhood" protecting the rich, the New Black Panthers should be looked upon as Founding Fathers who declare war and are "willing to die or kill to save our babies and to save a black nation that is dying before our eyes." New Black Panther Party chairman says he's 'willing to kill' in white war against blacks. When last we left our good friends of the New Black Panther Party, they were in Ferguson, MO attempting to kill the prosecutor in the Michael Brown case and trying to blow up the Gateway Arch. The FBI stopped those plots in their tracks, and the NBPP disappeared from the media for a few months. You just knew they couldn't keep their mouths shut about the Freddie Gray matter. And in typical Black Panther fashion, they are threatening to kill people in the "war" against blacks. Black Racist Group Plotted Bombing, Assassination but Charged with Gun Crime. The communist and racist New Black Panther Party plotted to bomb St. Louis' Gateway Arch and assassinate local law enforcement officials, but the Justice Department so far has limited its prosecution of the group to an indictment of two members on minor gun charges. The soft treatment for activities that normally would have brought federal terrorism charges appears to be part of efforts by Attorney General Eric Holder and the Justice Department to "go soft" on the racist group, according to former Justice official J. Christian Adams. Black Panther double cop killer sues for freedom because he plays the flute. The widow of a police officer shot 22 times by members of the Black Panther movement has called on parole officials to deny his killer's extraordinary bid for freedom. Patrolmen Joseph Piagentini and Waverly Jones were gunned down after being ambushed while on foot patrol in Harlem in 1971. Officer Piagentini pleaded with his attackers to spare him saying: 'I have got a wife and two young children'. But the ruthless killers emptied their gun on him and then seized his revolver as he scrambled to hide in some bushes and repeatedly shot him again. Officer Jones died from a single gunshot to the back of the head. Flames of Ferguson Illuminate Age of Obama. Last week, members of the New Black Panther Party were arrested by state officials for plotting to use pipe bombs against the St. Louis Gateway Arch and for purchasing guns in a plot to kill as many policemen as possible. Notice it was state officials who made the arrests. The Washington Times had a no-longer-surprising quote from an Obama administration official characterizing the plot to blow up the arch and kill (presumably) white police officers as "not a serious threat." Why do avoidable subplots involving the New Black Panthers keep shadowing this president? FBI: Saint Louis Black Panther Explosives Plot Involved Bombing Gateway Arch. The PC media is desperate to avoid using the chosen names of the black panther terror suspects Brandon Muhammad, and Olajuwon, also known as Olajuwon Ali and Brother Ali. This is a follow-up to the previous outline where the FBI revealed the two men were involved in straw purchases for firearms and making pipe bombs. We now know they were plotting assassinations of Ferguson Police Chief Tom Jackson, and Saint Louis Prosecutor Robert McCulloch, in addition to bombing the Gateway arch. Fox's Powers, Watters Erupt over Holder: 'Let Black Panthers off the Hook'. Fox's Outnumbered feasted on the resignation announcement of Attorney General Eric Holder Thursday [9/25/2014], listing Republican objections to Holder's tenure, which range from Fast & Furious to trying 9/11 perpetrators in Manhattan. But it was — wait for it — the Black Panthers around which the argument coalesced, with cohost Kirsten Powers and #oneluckyguy Jesse Watters clashing over what, if anything, had even happened that Holder allegedly had or had not ignored. Eric Holder's Original Sin. The details of the case are evil enough to outrage just about every American outside of a major media newsroom. On Election Day 2008, two New Black Panthers in paramilitary gear intimidated would-be voters at a Philadelphia polling place. One carried a nightstick. Both were abusive. "You are about to be ruled by the black man, cracker!" one of them yelled at a white voter. Black Panthers Indicted On Federal Gun Charges, Pipe Bomb Plot Near Ferguson. Members of the militant New Black Panther Party have been arrested and charged with making straw purchases of two handguns and are believed to have conspired to detonate pipe bombs during protests in Ferguson, Missouri, according to several reports. A Discussion On Race, Crime And The Inconvenient Facts. Among the pernicious aspects of our unnecessarily racialized atmosphere, one looms conspicuously: Why have the New Black Panther leaders not been arrested and prosecuted for their publicly announced bounty on Zimmerman — "dead or alive"? Such incitement is a federal crime. Curiously, the Black Panthers have been very sanguine about this potential legal jeopardy. Why? Might they know that they have a patron in the administration? Or perhaps they have heard that the Obama Justice Department has an official policy of prosecuting white-on-black offenses but not black-on-white. Obama's thug administration. When Black Panther thugs intimidated voters outside a polling station in 2008 in Philadelphia and were caught doing so on camera, Holder refused to prosecute BECAUSE THEY WERE BLACK! Had the incident been the other way around, how long do you think it would have taken for a swat team to arrest, prosecute and/or terminate the perpetrators? 'Kill Whitey' Panther is held on gun rap. The tattoo on his face says, "Kill Whitey" in block letters, and cops say the gun he carried was loaded and unlicensed. But that didn't stop Maruse Heath — head of the Philadelphia chapter of the New Black Panther Party — from claiming that he's really all about charity and outreach as he was arraigned on a gun-possession charge in Manhattan last night. New Black Panther: 'Praise Be to God' if George Zimmerman Is Killed in Prison. A member of the New Black Panther Party said he hopes George Zimmerman is found guilty and murdered in prison. "Anything less than death for George Zimmerman is not justice," Kojo Kayrallah, who identified himself as the chief of staff for the state of Florida, told the Daily Caller. Asked about the possibility of Zimmerman being killed in prison, Kayrallah responded, "praise be to God." Black Panther rally for Trayvon Martin drew 3 people in Tampa. Only three demonstrators showed up at a Justice for Trayvon Martin rally organized by the New Black Panther party near a Tampa courthouse Monday [7/15/2013]. The Labor Nominee's Other Lies. When the Inspector General of the Department of Justice (DoJ) last week issued a report blistering DoJ's Civil Rights Division, much attention focused on the IG's recognition that division chief Perez, under oath, had "not reflect[ed] the entire story regarding the involvement of political appointees" in the now-infamous 2009 decision to dismiss voter-intimidation cases against several New Black Panthers in Philadelphia. While this aspect of Perez's dishonesty deserves all the attention it can garner, it is far from the only example, from that very same testimony, of Perez pushing stories that were flagrantly false. Head of local New Black Panther Party arrested by Jacksonville police. The 50-year-old southern regional representative of Jacksonville's New Black Panther Party for Self Defense was arrested Monday [5/20/2013] on charges of false imprisonment and resisting an officer without violence, according to the Sheriff's Office. Mikhail Shareef Muhammad of North Myrtle Avenue remained held on $200,000 bail Wednesday, according to jail records. Eric Holder's Long History Of Lying To Congress. People have forgotten about the New Black Panther case, perhaps the most clear-cut case of voter suppression and intimidation ever. On Election Day 2008, New Black Panther Party members in military garb were videotaped intimidating voters outside a Philadelphia polling place. The slam-dunk prosecution of these thugs was dropped by Holder's Justice Department. IG Report Shows Viper's Den at Justice Department. While the IG labored mightily to credit almost every excuse offered by Obamite political appointees (and their ideological soul-mates in the career ranks) at Justice, the raw facts unearthed (or confirmed) in the new report make crystal clear the most important aspect of the Black Panther case all along: The dismissal of already-won charges against the Panthers was part and parcel of a long-running hostility within the Civil Rights Division — exacerbated and encouraged by the Obama political team — against race-neutral enforcement of civil rights laws. Justice Whistleblower Warns Senate on Labor Pick. The Department of Justice whistleblower who resigned over the New Black Panther Party voter intimidation case said President Barack Obama's labor secretary nominee Thomas Perez is the "most extreme cabinet nominee in 70 years." J. Christian Adams, who worked for Perez at the Department of Justice's Civil Rights Division, sent a stern warning to the U.S. Senate about Perez's policies. Sen. Vitter threatens to block Obama nominee for Labor secretary. Republican Sen. David Vitter vowed Monday [3/18/2013] to block President Obama's nominee for Labor secretary, citing a past run-in with his state of Louisiana as well as the nominee's role in the controversial voter intimidation case involving the New Black Panther Party. The president on Monday tapped Justice Department official Thomas Perez for the Labor post. The candidate, though, was already being questioned over a newly released report that found he gave incomplete testimony on the decision to drop charges against members of the new Black Panthers. Will New Black Panthers be back this year? You'll recall, especially if you've ever listened to conservative talk radio, that it was right here that the Election Day 2008 appearance of two local leaders of the smallish black-power posse outside a polling station at 12th and Fairmount in North Philadelphia — one brandishing a large nightstick — became a national controversy. Return of the New Black Panthers. They're back, no thanks to Attorney General Eric Holder. Members of the New Black Panther Party are again stalking the polls in Philadelphia. New Black Panthers Back at Philadelphia Polling Station. This is the same location where New Black Panther Party members wielded Billy clubs on Election Day in 2008. Voter intimidation charges against them were dropped by Attorney General Eric Holder's Department of Justice. Inspector General Report on Racialist Dysfunction inside DOJ. Today [3/12/2013] the Department of Justice inspector general released a report on potential Labor secretary nominee Tom Perez's DOJ Civil Rights Division. [...] The 250-page report offers an inside glimpse of systemic racialist dysfunction inside one of the most powerful federal government agencies. The report was prepared in response to Representative Frank Wolf's (R-VA) outrage over the New Black Panther voter intimidation dismissal. Cabinet a roster of far leftists. Attorney General Eric Holder, as a Columbia University student and leader of the Student Afro-American Society (SAS), participated in the armed takeover of a vacant campus ROTC office. The takeover lasted five days in the spring of 1970. [...] That same semester, Holder's Afro-American student group also declared its "full support of the Black Panther Party as a vanguard organization for the liberation" of black people, the Columbia paper reported on March 12, 1970. Suddenly, Holder's "Black Panther blind spot," as the Washington Times called the attorney general's failures to prosecute black radicals, is no longer a mystery. Holder sympathized with the Panthers then; he seems to sympathize with them now. City to recognize Black Panthers. The Winston-Salem chapter, organized in 1969, was the first to be formed in the Southeast. Nelson Malloy, an early member of the party who later became member of the Winston-Salem City Council, said he never imaged the Panthers would be recognized in such an official capacity. "But we are, in fact, part of the city's history," he said. Group of Veterans, Former SEALs Planning to Watch Polls For Possible Voter Intimidation. Four years ago, Fox News caught two members of the New Black Panther Party on tape outside a Philadelphia polling place. They appeared as though they were trying to intimidate voters. A retired Navy captain, Ben Brink, is trying to make sure nothing like that happens tomorrow. Great News: New Black Panther Party Members Plan to Put Their Boots on the Necks of Republicans. Going to the Republican National Convention in Tampa at the end of August? If so, watch out for New Black Panthers who plan to put their boots on your neck. New Black Panther's Graphic Charge: We Need to Kill White Babies by Bombing Nurseries. "Under siege." That's how New Black Panther Party Chief of Staff Michelle Williams describes the black community in Tampa, FL, site of the GOP convention. And you can bet she blames Republicans, whites, and "tea baggers." [...] But the most shocking comments come in a separate piece of audio posted on the site. In it, the host says blacks are "too scared" to drag whites out of their houses, skin them, hang them in trees, drag them behind trucks, and pour acid on them. Trashing the Constitution. Constitution Day is Monday, Sept. 17, so I compiled a non-exhaustive list of the ways Barack Obama has violated the Constitution. [...] [For example,] Violating equal protection and voting rights. The 14th Amendment guarantees "due process" and "equal protection of the laws." The 15th Amendment guarantees that "the right of citizens to vote shall not be denied or abridged on account of race." Mr. Holder ditched the case of New Black Panther Party members videotaped intimidating Philadelphia voters in 2008. Two former Justice Department officials testified that employees were told to ignore white complainants. The New York Times and New Black Panthers Protect Election Lawbreakers. Once upon a time in America, if a group of citizen volunteers set out to help election officials detect problems with the voter rolls, they would have been praised. If a group of citizen volunteers had detected scores of dead people on the voter rolls they would have received broad accolades from all corners of America. Once upon a time in America, we esteemed law abiding citizens who helped law enforcement detect law breakers — especially when it comes to the sanctity of elections. But this isn't the America we used to know. Bill O'Reilly: Recent New Black Panther revelations 'very bad news' for Holder, Obama. On his Tuesday [7/31/2012] Fox News Channel program during the "Talking Points Memo" segment, "The O'Reilly Factor" host Bill O'Reilly talked about a Monday Report that political appointees interfered in a prosecution of the New Black Panther Party in a case about a 2008 Election Day incident involving members of the New Black Panthers allegedly intimidating voters outside a Philadelphia polling location and violating the Voting Rights Act of 1965. The Monday report, O'Reilly explained, is more trouble for the embattled Obama Department of Justice. Holder's Perez: Perjury on Panthers? Late last month, the Obama/Holder Justice Department suffered another embarrassment, and showed that its leaders probably merit criminal prosecution, in a too-little-noticed spin-off from the infamous New Black Panther Party case. [...] The embarrassment came in the final court action of a long-running suit brought by the indefatigable Judicial Watch. Yes, vote fraud's real. [Eric] Holder, the most politicized attorney general since Nixon's John Mitchell, has consistently moved against any efforts to protect the integrity of the ballot box in the service of the party that keeps him employed. Infamously, he dropped prosecution of members of the New Black Panther Party, who were intimidating white voters outside a Philadelphia polling place during the 2008 presidential election. And he killed the case despite the urging of lawyers at Justice and members of the US Civil Rights Commission, which in a 2010 report accused Justice of "open hostility and opposition" to prosecuting cases with white victims. Federal Court: DOJ Official May Have Lied About the New Black Panther Case. In a little noted decision on July 23, a federal district court judge concluded that internal DOJ documents about the New Black Panther Party voter intimidation case "contradict Assistant Attorney General [Thomas] Perez's testimony that political leadership was not involved in" the decision to dismiss the case. In other words, the sworn testimony of Perez, the Obama political appointee who heads the Civil Rights Division, before the U.S. Commission on Civil Rights was apparently false. Federal judge rules political appointees interfered with voter intimidation case. Increasing attention is being paid to irregularities at the polls, and the legitimacy of efforts to minimize them. A federal judge just issued a ruling that will become part of this debate. As reported by Conn Carroll of the Washington Examiner, U.S. District Court Judge Reggie Walton "held today that political appointees appointed by President Obama did interfere with the Department of Justice's prosecution of the New Black Panther Party." Federal Court finds Obama appointees interfered with New Black Panther prosecution. A federal court in Washington, DC, held today [7/30/2012] that political appointees appointed by President Obama did interfere with the Department of Justice's prosecution of the New Black Panther Party. The ruling came as part of a motion by the conservative legal watch dog group Judicial Watch, who had sued the DOJ in federal court to enforce a Freedom of Information Act (FOIA) request for documents pertaining to the the New Black Panthers case. Judicial Watch had secured many previously unavailable documents through their suit against DOJ and were now suing for attorneys' fees. DOJ's Favorite New Black Panther Wants to Hang 'Crackers' From Nooses. Do you remember King Samir Shabazz of the New Black Panthers, the one who the Department of Justice allowed off the hook on voter intimidation charges after the 2008 election? Well, he's back in the news, spouting anti-white rhetoric and talking about beating on and killing "crackers." Disappointed in Obama, New Black Panthers openly consider 'the bullet'. The small but vocal New Black Panther Party is woefully disappointed in President Barack Obama, and is openly implying that the best way to reach its goals is no longer through "the ballot" but through "the bullet." [...] Seasonally adjusted black unemployment in America currently stands at 13.0 percent, compared to the entire country's 8.1 percent. New Black Panthers Threaten to Kill Crackers. The St. Pete - Tampa New Black Panthers are tweeting out threats to murder whitey. If you see anything wrong with that, you must be a racist! New Jim Crow in Guam: Where's Holder? [Scroll down] But under Eric Holder, the Justice Department has engaged in a pattern of selective enforcement of discrimination laws. In 2009, it infamously dismissed a voter-intimidation lawsuit the departing Bush administration brought against the New Black Panther Party, even though the case had been effectively won in court. Justice's former Voting Section chief Christopher Coates testified before the U.S. Civil Rights Commission in 2010 that he was informed by Julie Fernandes, an Obama-appointed deputy assistant attorney general, that the Voting Rights Act was not to be enforced in cases where racial minorities were accused of discrimination. Zimmerman family challenges Holder on New Black Panthers. In a letter to Attorney General Eric Holder on Monday [4/9/2012], obtained exclusively by The Daily Caller, a family member of George Zimmerman asked the nation's top law enforcement officer why he has chosen to not arrest members of the New Black Panther Party for their rhetoric — some of which may fit the federal government's definition of a hate crime — throughout the Trayvon Martin case. The family member believes the reason Holder hasn't made those arrests is because he, like the members of the New Black Panther Party, is black. Holder's Black Panther blind spot. What is it about the Justice Department and the Black Panthers? On March 24, Mikhail Muhammad, leader of the New Black Panther Party, offered a $10,000 bounty for the "capture" of George Zimmerman, who shot and killed Trayvon Martin. The Panthers distributed wanted posters, calling him a "child killer" and offering the bounty "dead or alive." Muhammad warned that Mr. Zimmerman "should be fearful for his life." These acts were almost certainly criminal. A Death Bounty and an Attorney General. One can be forgiven for wondering what level of New Black Panther Party (NBPP) thuggery is sufficient to warrant the attention of Florida law enforcement officials or, seemingly, the most myopic U.S. attorney general to ever head the Department of Justice. On March 24th, New Black Panther Party leader Mikhail Muhammad offered a $10,000 bounty for the "capture" of Zimmerman and publicly stated that Zimmerman "should be fearful for his life." Fellow Panthers distributed wanted posters calling Zimmerman a "child killer" and offering that bounty "dead or alive." And in a mind-boggling rant during a conference call, Michelle Williams, Chief of Staff for the Tampa, FL branch of the NBPP, told Party members to get ready for a "race war." New Black Panther Party seeks citizen's arrest of George Zimmerman. Death threats and a $10,000 bounty offered for a citizen's arrest of George Zimmerman have raised concerns about the threat of "vigilante justice" in the racially charged case. A group identifying itself as the New Black Panther Party is offering $10,000 to anyone who makes a citizen's arrest of George Zimmerman in the Trayvon Martin slaying. Laura Ingraham: Eric Holder Not Going To Investigate The 'Black Panthers'. Radio host Laura Ingraham paid a visit to Fox & Friends Tuesday morning [3/27/2012], where she was asked to weigh in on The New Black Panthers' $10,000 bounty for the "capture" of George Zimmerman, the 28-year-old volunteer neighborhood watch captain who shot and killed 17-year-old Trayvon Martin in Sanford, Florida. "They want him 'dead or alive'," noted host Gretchen Carlson. New Black Panthers 'booted, suited, and armed' for coming 'race war'. This crop of New Black Panther leaders make Stokely Carmichael look like a Sister of Mercy. New Black Panthers Call to Create "Red Sea" of "Bloodshed". The New Black Panther Party wants a race war and they want it to start tomorrow. In an audio recording of a planning meeting for a Trayvon Martin rally, New Black Panther Party members have resorted to violent action for what they are calling "revolution." 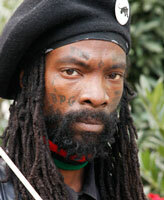 New Black Panther leader jailed on weapons charge. Hashim Nzinga, 49, was was arrested for possession of a firearm by a convicted felon, the DeKalb County Sheriff's Office said Monday [3/26/2012]. ... Nzinga recently announced on CNN that his group was offering a $10,000 reward for the capture of George Zimmerman, the man who fatally shot 17-year-old Trayvon Martin in Sanford, Fla. CNN identified Nzinga as the chief of staff of the New Black Panther Party. How Many Crimes Did the New Black Panthers Commit in Florida? Let's start with solicitation to kidnap. In announcing a reward for the seizure of Zimmerman, the New Black Panthers may have violated Florida Code 787.01. It makes it a felony to "by threat, confining or abducting, or imprisoning another person against his ... will without lawful authority with intent to ... terrorize." Merely soliciting someone else to do this is also a felony in Florida under Florida Code 777.04. New Black Panthers Activity Against Zimmerman May Be Criminal. Florida law makes it a felony to unlawfully seize somebody as a mob, or "at the behest of a mob." Again, solicitation to commit this crime is also a crime. It's a felony, too, to interfere with the administration of government with use of force — and yes, again, solicitation is a crime. ABC News: Screams were Zimmerman's, not Trayvon Martin's. I had a bad feeling about this white-man-shoots-innocent-black-teen narrative. Too simplistic. Too pre-Civil Rights. Too easy for millionaire race-baiters such as Al Sharpton, Louis Farrakhan and Jesse Jackson Sr. to exploit. There is evidence that the story is true. There is evidence that it is not. Likely the truth falls somewhere in between. Now brave souls have stepped forward to defend the white man, George Zimmerman. They face real danger from a mob that racist terrorist group, the New Black Panther Party, which has offered $10,000 to bring George Zimmerman in dead or alive. Friends fear for safety of man who shot Florida teen. George Zimmerman, who has claimed he shot Trayvon Martin on February 26 in self-defense, is staying at an undisclosed location after widely circulated death threats and word of a $10,000 bounty to find him, said legal adviser Craig Sonner, who said he would represent Zimmerman if charges are filed. This is the equivalent of a lynch mob. New Black Panthers Offer $1 Million For Zimmerman's Capture. The New Black Panther Party is offering a reward for the capture of George Zimmerman in the Trayvon Martin case. 'New' Black Panthers same as the old — only worse. With Louis Farakhan threatening "retaliation" for the killing of Trayvon Martin, you might have wondered if African American leaders could make the situation any worse. They did. George Zimmerman: Wanted Dead or Alive. Who's up for a little street justice? The New Black Panther Party, for starters. They're circulating a "Wanted: Dead or Alive" poster for George Zimmerman, the 28-year-old neighborhood watch volunteer who shot 17-year-old black youth Treyvon Martin last month. New Black Panthers offer $10,000 bounty for capture of George Zimmerman. Members of the New Black Panther Party are offering a $10,000 reward for the "capture" of George Zimmerman, the Neighborhood Watch volunteer who shot Trayvon Martin. New Black Panther leader Mikhail Muhammad announced the reward during a protest in Sanford Saturday. And when asked whether he was inciting violence, Muhammad replied defiantly: "An eye for an eye, a tooth for a tooth." Where's the Republican candidate for mayor? The city has not had a mayor from the Grand Old Party since Theodore Roosevelt McKeldin in 1967, and as of this writing, no Republican has entered the field of candidates for the 2016 municipal election. Two Black Panthers, Advocates for ISIS, Admit Plot To Bomb Ferguson and Saint Louis Police. This story is interesting both for the content the media share and for the content the media avoid sharing. Both Saint Louis suspects are admitted members of the New Black Panther organization; both suspects are also admitted Islamist Radicals and believers in ISIS jihad. However, as previously pointed out, you'll have a hard time finding the connection between NBPP and ISIS in any media article. Contrast against the media reports yesterday about "right-wing" domestic terror threats and the DOJ inquiry. Stop Giving Obama Radicals the Benefit of the Doubt. The Obama administration policies, ranging from Fast and Furious, to the New Black Panther dismissal, to the debacle of Obamacare, are not incompetent follies. They are instead representative of ideological desires deliberately implemented through the mechanisms of power available to this administration. Fast and Furious emerged because of hostility to the constitutional right to bear arms. The New Black Panther dismissal happened because the civil rights industry today doesn't think civil rights laws should be used against "people of color." Every nutty and seemingly dumb Obama policy has a genesis in ideological radicalism. These and other seemingly dumb Obama administration decisions are features; they are not glitches. Stop treating them like glitches. Holder Has Long Been Contemptible. [Scroll down] If two members of the Ku Klux Klan had held a baton in front of polling station in Philadelphia, Mississippi, to intimidate black voters, Holder would have spared no effort to prosecute them. But when it comes to two members of the New Black Panthers holding a baton in front of polling station in Philadelphia, Pennsylvania, to intimidate white voters, Holder could not care less. Holder's Chutzpah. Attorney General Eric Holder recently told a group of black clergymen that the right to vote was being threatened by people who are seeking to block access to the ballot box by blacks and other minorities. This is truly world-class chutzpah, by an Attorney General who stopped attorneys in his own Department of Justice from completing the prosecution of black thugs who stationed themselves outside a Philadelphia voting site to harass and intimidate white voters. SPLiCing the Facts. The left-wing Southern Poverty Law Center's "hate groups map" lists conservative organizations such as the DC-based Traditional Values Coalition and Catholic Family Ministries, Inc. as hate groups alongside Ku Klux Klan chapters and the New Black Panther Party. New Panthers' war on whites: Minister King Samir Shabazz is chairman of the New Black Panther Party's Philadelphia chapter. In black beret atop dreadlocks and a black military uniform, he spends most weekdays near City Hall condemning "crackers" and exhorting black passers-by to rise up against their "slavemasters" — and to give him $2 for the party's semi-annual newspaper. Democrats: It's OK When We Politicize the Justice Department. The "politicization" of the Justice Department was one of many aspects of the Bush administration which the Obama administration was going to cure. But it appears that while the party of the administration has changed, we are seeing a level of political meddling at the Justice Department which the Bush administration never remotely approached. First, we had word that Eric Holder overruled the career attorney lawyers' research on the issue of voting rights for the District of Columbia. Now we learn that political appointees have overturned the work of career attorneys attempting to prevent voter intimidation by the New Black Panther Party. Who pressured Justice to drop case against voter intimidation in Philly? After screaming for 8 years about Bush "politicizing" the Justice Department, it appears that there is a clear cut case of interference in a legitimate prosecution of the New Black Panther Party for intimidating voters at a polling station in 2008 by Obama appointees. Charges Against 'New Black Panthers' Dropped by Obama Justice Dept.. Charges brought against three members of the New Black Panther Party for Self-Defense under the Bush administration have been dropped by the Obama Justice Department, FOX News has learned. The charges stemmed from an incident at a Philadelphia polling place on Election Day 2008 when three members of the party were accused of trying to threaten voters and block poll and campaign workers by the threat of force — one even brandishing what prosecutors call a deadly weapon. Protecting Black Panthers. Imagine if Ku Klux Klan members had stood menacingly in military uniforms, with nightsticks, in front of a polling place. Add to it that they had hurled racial threats and insults at voters who tried to enter. Now suppose that the government, backed by a nationally televised video of the event, had won a court case against the Klansmen except for the perfunctory filing of a single, simple document — but that an incoming Republican administration had moved to voluntarily dismiss the already-won case. Surely that would have been front-page news, with a number of firings at the Justice Department. The flip side of this scenario is occurring right now. Civil Rights: Who are the "Cowards"? On taking office as Attorney General of the United States, Eric Holder stated that America is a nation of "cowards" when it comes to race and that he would commit the Department of Justice to making civil rights cases a top priority. President Obama himself promised to "reinvigorate federal civil rights enforcement," especially by prosecuting cases of voting discrimination against blacks. On May 15 Obama's Department of Justice quashed a civil rights case involving voter intimidation by blacks in Philadelphia on election day, 2008. The U.S. Department of Injustice. Let's examine the uproar over Attorney General Eric Holder's decision to protect hate-mongering thugs who harassed and bullied precinct workers and voters on Election Day in Philadelphia. Oh, wait. There's been no uproar. Let me tell you why. Holder Winks at Voter Intimidation. When Eric Holder became U.S. attorney general, he promised to administer the law in an objective, nonpolitical manner. So it's disappointing that the Justice Department had spent the last several months misinterpreting key voting rights laws for nakedly political reasons. Exhibit A: Justice's inexplicable dismissal of a civil lawsuit for voter intimidation against the New Black Panther Party. The Black Panthers weren't content to endorse Barack Obama. They sent their members to the polls last November to "patrol election sites." U.S. Commission on Civil Rights Demands Answers. The Obama Justice Department took the unusual action last month of dismissing a default judgment against the New Black Panther Party in connection with a case of voter intimidation on Election Day on November 4, 2008. Members of the NBPP were caught on film blocking access to the polls and physically and verbally intimidating voters, even going so far as to wield a nightstick in front of voters and poll watchers. The Justice Department's lawyers gathered evidence, obtained the affidavit of former civil rights advocate Bartle Bull, and filed a complaint. When the defendants did not respond and the court invited the Justice Department to file a default judgment, the case was inexplicably withdrawn. Why Did Justice Drop New Black Panthers' Case? Rep. Frank Wolf (R-Va.) is waiting for an answer to his June 8 letter to Attorney General Holder. And he may wait a good while longer because the Justice Department doesn't want to explain its decision to dismiss its civil case — the worst case of voter intimidation in many years — and not pursue a criminal indictment. Flack Panthers. For some reason, the Justice Department is covering for the Black Panthers. For months, congressmen have asked the Justice Department a simple question: How could the department drop one of the worst voter-intimidation cases ever? The department's only explanation was revealed in its dismissal filing with the court; the case was dropped because the defendants, two members of the New Black Panthers, offered no defense. This is unsatisfactory grounds for such a serious civil rights abuse. Return of the Black Panther. Rarely does the U.S. Commission on Civil Rights vote unanimously on anything. A partisan divide has made the commission contentious in recent years. Yet the Department of Justice's decision to forfeit its voter-intimidation case against the New Black Panther Party and three individual defendants drew a 6-0 vote with one abstention by the commission. What unified the commission was outrage at the Justice Department for letting the Black Panthers off the hook. GOP, Holder battle over New Black Panthers. Key House Republicans are charging Attorney General Eric Holder of playing politics at the Justice Department. Rep. Frank Wolf (R-Va.) said Holder has ignored at least three letters sent over the past month from Republicans demanding to know why Justice dismissed charges of voter intimidation filed against two members of the "New Black Panther Party for Self-Defense". No. 3 at Justice OK'd Panther reversal. Associate Attorney General Thomas J. Perrelli, the No. 3 official in the Obama Justice Department, was consulted and ultimately approved a decision in May to reverse course and drop a civil complaint accusing three members of the New Black Panther Party of intimidating voters in Philadelphia during November's election, according to interviews. Lawmakers want answers, seek refiling in Panther case. Congressional Republicans on Thursday [7/30/2009] escalated their criticism of the Justice Department for dismissing a controversial voter-intimidation case, demanding that civil charges against the New Black Panther Party be restored. They also renewed their request to interview career attorneys who disagreed with the administration's decision to dismiss the charges. Obama Justice Official Nixed Black Panther Prosecution. In a past national election, a uniformed hate group stood outside a polling place with a two-foot-long police nightstick in hand, screaming racial epithets and threats in a successful effort to prevent citizens from voting and poll watchers from doing their jobs. The Department of Justice investigated, the career counsel approved the institution of a civil complaint, and one was brought. The defendants offered up no defense. They failed even to appear in court. The federal district court judge entered default judgments against the defendants. Later he ordered the Justice Department to file motions for the entry of default judgments, formally acknowledging they had won. At this time, over the objections of career counsel, Associate Attorney General Thomas J. Perrelli ordered the case dropped. Hack Panthers. The Justice Department's decision to drop an already-won voter-intimidation case against members of the New Black Panther Party merits multiple, independent investigations. On Tuesday [7/28/2009], Rep. Frank R. Wolf, Virginia Republican, officially asked Attorney General Eric H. Holder Jr. to refile the case. Mr. Holder should comply. So far, the Justice Department has stonewalled legitimate inquiry. Eric Holder's Hate Crime Color Scheme. The DOJ Web site states: "If you know of activities that intimidate, coerce, threaten, or oppress voters based on race, color, religion, or national origin, please contact the Criminal Section." Holder needs to explain why its "Criminal Section" isn't prosecuting the Panthers on felony charges of violating 18 U.S.C. 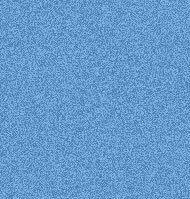 § 245. Eric Holder's Justice Department. [It is] surprising that in the first seven months of the Obama administration, a series of hyper-partisan decisions, questionable appointments, and the inexplicable dismissal of a high-profile voter intimidation case against the New Black Panther party have once again fanned suspicions that the Justice Department is a pawn in partisan political battles. Both in Congress and among a number of current and former Justice Department employees is a growing concern that the Obama administration is politicizing the department in ways the Bush team never imagined. Panel blasts Panther case dismissal. The U.S. Commission on Civil Rights is demanding that the Justice Department explain why it recently dismissed a civil complaint against members of the New Black Panther Party who disrupted a Philadelphia polling place during last year's election, saying the department has offered only "weak justifications." 'Non-responsive' Justice Department pressed again on Panthers case. The U.S. Commission on Civil Rights on Friday [8/7/2009] demanded for the second time that the Justice Department explain its dismissal of charges against members of the New Black Panther Party who disrupted a Philadelphia polling place during the November elections, saying a previous response was "largely non-responsive" and "paints the department in a poor light." Justice Dept. pressed to explain Panthers dropped charges. The U.S. Commission on Civil Rights is expected to approve Friday the sending of a second letter to the Justice Department, asking it to justify its decision in May to drop charges against members of the New Black Panther Party accused of intimidating voters at a Philadelphia polling place in the November election. Black Panther case expands. Even if the liberal media continue to ignore it, the Justice Department's dismissal of a voter-intimidation case against members of the New Black Panther Party is a full-blown scandal. Fortunately, the U.S. Commission on Civil Rights is pursuing justice even though the Department of Justice is not. Black Panther Case Draws Scrutiny. The inexplicable dismissal by the Obama Justice Department of the default judgment in a case of egregious voter intimidation at a Philadelphia polling place on Election Day 2008 has unleashed a torrent of questions about why the case was dropped against all but one defendant (the individual actually wielding a nightstick got off with a proverbial slap on the hand) and who made the decision to drop it. The Justice Department has stonewalled, claiming career attorneys made the call. Intimidate the CIA, leave Black Panthers alone? [Scroll down] More importantly, consider Justice's treatment of jackboot-wearing members of the New Black Panther Party for Self-Defense — Malik Zulu Shabazz, Jerry Jackson and Minister King Samir Shabazz (who brandished a billy club) — who were caught on tape intimidating voters at a Philadelphia polling place in November. The hostile and racist intentions of the Black Panther organization are well-known. Jackson, who is also an elected official in Pennsylvania's Democratic Party, listed "Killin' Crakkkas" among his interests on his MySpace page, which was extensively edited only after reporters began looking into his background. Holder's Black Panther Stonewall. President Obama's Justice Department continues to stonewall inquiries about why it dropped a voter intimidation case against the New Black Panther Party. The episode — which Bartle Bull, a former civil rights lawyer and publisher of the left-wing Village Voice, calls "the most blatant form of voter intimidation I've ever seen" — began on Election Day 2008. Mr. Bull and others witnessed two Black Panthers in paramilitary garb at a polling place near downtown Philadelphia. Another Promise Broken — in Record Time. Remember those days of yore, namely the presidential campaign of 2008, when Democrats regularly accused the Bush administration of politicizing the Justice Department? You could scarcely make your way down the aisle of the U.S. Senate without encountering a Democrat who was outraged, indignant and generally all het up over how the administration of justice had been corrupted. Video: Obama Lets Black Panthers Intimidate Voters. Civil Rights Commission Demands Voter Intimidation Answers. The U.S. Commission on Civil Rights sent a letter in August to Attorney General Eric Holder, issuing a stinging rebuke to the Obama administration's Department of Justice (DOJ). A footnote in the letter criticized the DOJ's dismissal of a Philadelphia voter intimidation case against a group called the New Black Panther Party for Self-Defense (NBP). The footnote called the DOJ's voluntary dismissal of the case "even more corrosive to the rule of law than the dismissal without comment." Inquiry opened into New Black Panther case. The Justice Department's Office of Professional Responsibility has begun an official inquiry into the dismissal in May of a civil complaint against the New Black Panther Party and two of its members who disrupted a Philadelphia polling place during the November general elections. Race to injustice. Attorney General Eric H. Holder Jr. should answer one key question — Will the Justice Department fight against civil rights violations of white people as avidly as those against people of color? This is the subtext of the U.S. Civil Rights Commission's investigation into why the Justice Department dropped an already-won voter-intimidation case against agents of the New Black Panther Party. Obama Justice Department still stonewalling Civil Rights Commission. What do you do if you're the Obama administration and you've been caught playing politics with the law? You stonewall the matter until people get tired of trying to get to the bottom of your malfeasance and go away. This seems to be the tactics being used by Obama's Justice Department as they continue to play games with requests from the US Commission on Civil Rights who want answers to questions regarding the dropping of the New Black Panther party's voter intimidation case. Holder asked to quicken probe of Black Panther case. The U.S. Commission on Civil Rights asked Attorney General Eric H. Holder Jr. on Wednesday [9/30/2009] to name a Justice Department official to oversee the production of what it called "our overdue information requests" for documents in the dismissal of a civil complaint against New Black Panther Party members accused of disrupting a polling place in the November elections. Panther injustice continues. The U.S. Civil Rights Commission is not backing off its showdown with the Justice Department about mishandling the voter-intimidation case involving agents of the New Black Panther Party. Nor should it. Yesterday [9/30/2009], the commission sent a letter to Attorney General Eric H. Holder Jr. demanding that Justice "fully cooperate," according to specific legal authority vested in the commission, with the commission's inquiry about why Justice dropped the case after it had already been won. Black Panther Answers 'Overdue'. The Chairman of the U.S. Civil Rights Commission, Gerald A. Reynolds, has sent a letter to U.S. Attorney General Eric Holder seeking answers to their questions about a voter intimidation case in Philadelphia involving the New Black Panther Party (NBPP). It considers the responses "overdue." The letter, dated September 30, 2009, is seemingly an unprecedented action. It asks for Mr. Holder to "instruct Department officials to fully cooperate" with the Commission's investigation, as required by federal law. Subpoenaed Black Panthers. Could the U.S. Commission on Civil Rights actually subpoena U.S. Attorney General Eric H. Holder Jr.? That scenario is unlikely, but it suddenly has entered the realm of possibility. The Civil Rights Commission is making a full inquiry into a controversy about a voter-intimidation case against the New Black Panther Party and several of its members and has escalated its investigation. Lawmakers hit silence on Panther complaint. Two senior lawmakers on Wednesday [12/2/2009] said the Justice Department, after five months of "repeated questions," again refused to say why it "wrongfully dismissed" a civil complaint against members of the New Black Panther Party who were accused of voter intimidation at a Philadelphia polling place during the November 2008 presidential elections. Justice thwarts Black Panther subpoenas. Could it be that President Obama's legal team is imploding due to a voter intimidation case involving the New Black Panther Party? So many new developments regarding the Black Panther case occurred in the latter half of last week that it is hard keeping up with them all. But none of them look good for the Obama administration or for Attorney General Eric H. Holder Jr.'s Justice Department. Is the Holder DoJ imploding? The Washington Times suggests in an editorial that the fallout from the Department's refusal to proceed with the New Black Panther party's criminal prosecution for voter intimidation is causing an implosion in the Holder Department of Justice. Justice Dept. subpoenaed in New Black Panthers case. The U.S. Commission on Civil Rights, frustrated by the Justice Department's failure to explain the dismissal of charges against New Black Panther Party members who disrupted a Philadelphia polling place during last year's elections, has subpoenaed the department demanding records showing how the case was handled. A Black Panther sings. The heat is rising against the Justice Department's mishandling of the voter intimidation case against the New Black Panther Party and three of its members. The last thing Attorney General Eric H. Holder Jr. needed was for the party's national chieftain to resurface in Mr. Holder's defense, but that's exactly what Malik Zulu Shabazz, the party chairman, did on Dec. 4. It says a lot about the Obama Justice Department that it is being promoted by a Black Panther. Black Panther battle intensifies. For six months, various members of Congress and the commission have been asking for cooperation from the Justice Department. The basic questions are simple enough: On what legal basis did Justice drop these cases, which it effectively already had won? Justice restrains lawyers in Panther inquiry. The Justice Department has told the federal attorneys who filed a civil complaint against the New Black Panther Party for disrupting a Philadelphia polling place last year not to cooperate with an investigation of the incident by the U.S. Commission on Civil Rights. The commission last week subpoenaed at least two Justice Department lawyers and sought documents from the department to explain why the complaint was dismissed just as a federal judge was about to punish the New Black Panther Party and three of its members for intimidating voters. Wolf presses for new Black Panther probe. A senior House Republican on Thursday [12/17/2009] introduced a "resolution of inquiry" that would require the House Judiciary Committee to seek answers on why the Justice Department dismissed a civil complaint against members of the New Black Panther Party who disrupted a Philadelphia polling place in last year's elections. Holder Stonewalling Congress Over Black Panther Investigation. Rep. Frank Wolf, R.-Va., issued a public statement Thursday saying that President Obama's Attorney General, Eric Holder, has instructed staff attorneys to ignore legal subpoenas by the U.S. Civil Rights Commission (CRC) requesting information about the New Black Panther Party voter intimidation case. This is in stark contrast to Mr. Obama's pledge for transparency in government. Civil Rights Panel Subpoenas Justice Department in New Black Panthers Case. The United States Civil Rights Commission, an eight-member agency that investigates accusations of discrimination, has launched its latest offensive against a most unusual target: the Justice Department. Black Panther case: Has a head rolled? Main Justice reports that Christopher Coates, head of the Justice Department's voting rights division, has been removed from his post and replaced. But no, the administration isn't doing damage control after it mysteriously dropped voter intimidation charges against three members of the Black Panther Party who rather openly intimidated Philadelphia voters on Election Day 2008. Justice Dept. moves Panthers pursuer to S.C.. The veteran Justice Department voting rights section chief who recommended going forward on a civil complaint against members of the New Black Panther Party after they disrupted a Pennsylvania polling place in last year's elections has been removed from his post and transferred to the U.S. attorney's office in South Carolina. Formal inquiry sought in polling case. A senior House Republican plans Wednesday [1/13/2010] to introduce a "resolution of inquiry" calling on the House Judiciary Committee to formally ask Attorney General Eric H. Holder Jr. to explain why the Justice Department dismissed a civil complaint against the New Black Panther Party after party members disrupted a Philadelphia polling place in last year's elections. Menacing turn in Black Panther case. The Justice Department told the U.S. Commission on Civil Rights to drop dead yesterday [1/12/2010]. The growing controversy is over a voter-intimidation case involving the radical New Black Panther Party and why Justice is carrying water for the villains. The department's intransigence should frighten Congress because Justice is asserting broad privileges that undermine congressional authority to oversee government's executive branch. What's the Basis for Holder's Stonewall?. In the flap over the New Black Panther Party case, the Justice Department appears to be making up rules as it goes along. House panel rejects Panther resolution. The Democrat-controlled House Judiciary Committee on Wednesday rejected by a 15-14 vote a resolution of inquiry that would have forced the Justice Department to tell Congress why it dismissed a civil complaint against members of the New Black Panther Party who disrupted a Philadelphia polling place in the November 2008 election. Obama Justice Department sanctioned. There needs to be a housecleaning at the very troubled Justice Department, and the top echelons of the Civil Rights Division is the right place to start. Its division chief — a presidential appointee — and its highly politicized senior career employees promote liberal ideology more than they enforce the law. Panther politics: The Justice Department insists that only "career employees" made a controversial decision last May to drop voter-intimidation charges against members of the New Black Panther Party. An analysis by The Washington Times, however, suggests good reason to ask if the White House itself interfered in the case. Annotated Panther timeline: The question all along, just as it had been with the Bush Justice Department, has been whether the Obama Justice Department interfered with ongoing investigations for political reasons, and whether that interference came from the White House itself. The New Black Panthers and the White House. The more the Obama administration fights the subpoenas from the U.S. Commission on Civil Rights and denies congressmen's requests for answers concerning the inexplicable dismissal of the voter-intimidation case in Philadelphia against the New Black Panther Party (NBPP), the more reasonable people wonder what the administration has to hide. And so it is appropriate now to ask: What did the White House know and when did it know it? Justice refuses to release documents in Panther case. The Justice Department, citing privilege claims, has refused to release e-mails and other documents sought under an open records request by The Washington Times to explain its decision last year to dismiss a civil complaint accusing the New Black Panther Party of intimidating voters at a Philadelphia polling place. Justice foils FOIA. The Justice Department is withholding documents demanded by this newspaper under terms of the Freedom of Information Act (FOIA). In so doing, the department is asserting privileges that do not exist or do not apply. Ironic as it may sound, Justice seems to be breaking the law. The Washington Times' FOIA request asked for documents pertaining to the department's controversial decision to dismiss a civil complaint accusing the New Black Panther Party of intimidating Philadelphia voters on Election Day 2008. Holder and the Black Panthers: During the last Presidential election, a gang of men calling themselves Black Panthers showed up at a polling place in Michigan. They threatened any voter who did not vote for Barack Obama. This was witnessed and documented. The bullying was barely reported in the media. Even though it is an unequivocal violation of voting rights laws, it was decided by Obama's Attorney General, Eric Holder, not to prosecute the case at all. Caged Panther investigation. A Feb. 2 letter from Glenn A. Fine, inspector general for the Justice Department, to Rep. Frank R. Wolf, Virginia Republican, ought to give pause to lawmakers of any party. In effect, the letter says there is no independent authority that can investigate any decision by the department to stonewall congressional inquiries. If the department refuses to answer congressional questions by asserting legal privileges that have never been recognized in U.S. history, the IG is powerless to assess allegations of certain sorts of departmental misconduct. Does Justice lack ethics? The rot at the Department of Justice grows more evident every day. Already being hit for botched decisions about terrorist trials and for dropping a voter-intimidation case against the New Black Panther Party, the department is taking another huge blow. Justice is Blind. Something is rotten at Barack Obama's Justice Department. ... The DOJ's Civil Rights Division is, as Assistant Attorney General for Civil Rights Thomas Perez put it, "open for business again." Perez has expressed shock at the lack of hate crimes prosecutions under George W. Bush. ... Is there any civil rights situation in which Perez won't stick his nose? Actually, yes — the Black Panther case has been ignored for months. Panel: Justice stonewalling on Panthers. President Obama or Attorney General Eric H. Holder Jr. should declare publicly whether executive privilege has been invoked in the Justice Department's refusal to release documents showing why voter-intimidation charges against the New Black Panther Party were dismissed, says the U.S. Commission on Civil Rights. Congress is derelict on Black Panther case. Eleven months ago, the Justice Department suddenly and surprisingly dropped its case against three defendants and accepted a weak injunction against a fourth, stemming from the incident in Philadelphia on Election Day 2008 in which Black Panthers disrupted a neighborhood polling place. Since then, the Justice Department has stonewalled multiple requests for information from news organizations, a number of congressmen and the U.S. Commission on Civil Rights. Eric Holder, still hiding from the Philly Black Panthers case. Attorney General Eric Holder spoke yesterday at the Holocaust Memorial Museum, extolling the Justice Department's central role in "today's struggle to promote tolerance, peace, justice and the rule of law." His timing could not be more ironic, because on the very same day, the attorney general failed to comply with the U.S. Commission on Civil Rights's deadline to report whether the DOJ will allow its employees to testify in the commission's investigation of the DOJ's extraordinary decision to drop its prosecution of Black Panther Party members who menaced voters at the polls on Election Day 2008. The politics of intimidation. On the first Tuesday in November, two uniformed men arrived at a voting place and took up positions by the entry doors. In the hours that followed, they harassed voters and election officials, hurled racial epithets and physically blocked persons of other races who sought to cast their votes for president of the United States. One of the men brandished a nightstick. Bartle Bull, a civil rights movement veteran, was there. He says it was "the most blatant form of voter intimidation I have encountered in my life in political campaigns in many states, even going back to the work I did in Mississippi in the 1960s." Media Still Uninterested In Blatant Voter Intimidation. Voter intimidation is a serious threat to our democracy — a parasitic anomaly that many Americans have sacrificed a great deal to prevent. It is unconscionable that we live in a modern society in which such overt thuggery coexists with rational thought and practice. Even more perplexing and disturbing is a federal government, led by an incompetent Justice Department, which appears more than willing to tolerate such antics. What Did Eric Holder Know and When Did He Know It? From the beginning of the New Black Panther Party scandal, the Obama Justice Department insisted that the decision to dismiss a case of egregious voter intimidation was made by career attorneys. Now we are learning that there was significant involvement by political appointees, including the attorney general himself. Why is Justice Department refusing to allow its career attorneys to testify? A former career Voting Section chief of the Justice Department shocked coworkers at his going-away luncheon by allegedly "reciting a written defense of his decision to file" a case against two members of the "New Black Panther Party." ... The Justice Department has been reluctant to pursue the case, going so far as to transfer [Voting Section chief Chris] Coates to South Carolina. Voter Intimidation, New Black Panther Style. The Obama Justice Department wants to ignore what happened at a Philadelphia polling place on Election Day 2008. Justice official: Black Panther polling case lacks proof. Assistant Attorney General Thomas E. Perez told the U.S. Commission on Civil Rights on Friday there was "insufficient evidence" to bring a civil complaint against members of the New Black Panther Party who disrupted a Philadelphia polling place in the 2008 general elections. The Justice Department could have made such a statement weeks ago and avoided some of the "stonewalling" accusations. But there are eyewitnesses and photographs, so how "insufficient" could the evidence be? Black Panthers but no white rights. Let's avoid all the mealy-mouthed euphemisms: In the now-infamous New Black Panther Party voter intimidation case, Attorney General Eric H. Holder Jr.'s Justice Department stands accused of being dishonest, racist, political hacks. The department's responses to those charges have been so weak that they may as well have pleaded nolo contendere. A hearing today [5/14/2010] by the U.S. Commission on Civil Rights provides the department one more chance to adequately explain itself. Right now, no adequate explanation seems to exist. Only in Philly: Black Panther on the Ballot! Jerry Jackson, notorious member of the New Black Panther Party, who was seen in [a video clip] intimidating and threatening voters in 2008, is running for re-election as a member of the Democratic Executive Committee in Philadelphia. DoJ trial attorney in Black Panthers case resigns in protest. Eric Holder has stonewalled Congress, the Civil Rights Commission, and the American people regarding the inexplicable order that political appointees at Justice gave last year to drop the slam dunk winning case against the New Black Panther party. Members of the group were caught on tape clearly intimidating white voters at a Philadelphia polling place. A summary judgment followed but before sentencing, Justice dropped the case. No Justice for Panther prosecutor. Something is wrong with a Justice Department that treats its own attorneys worse than it treats civil-rights violators those attorneys would prosecute. On Friday, after evasive testimony by Justice official Thomas E. Perez to the U.S. Commission on Civil Rights, department attorney J. Christian Adams resigned in obvious disgust at the deep-sixing of a voter intimidation case against members of the New Black Panther Party. Eric Holder Vs. Black Panthers. The Justice Department explains that it dropped a Black Panther voter-intimidation case because of lack of evidence. Pay no attention to the thugs outside the polling place. Yet another reason Eric Holder must go. Justice Department Sued Over Black Panther Documents. The Justice Department has been stonewalling individual members of Congress and the U.S. Commission on Civil Rights in their efforts to get to the bottom of the Obama-Holder Justice Department's decision to abandon a default judgment against the New Black Panther Party and multiple individual defendants in a case of blatant voter intimidation. Black Panthers 'Prepare for War' Against Tea Party. "With the rise of the Tea Party, the white-right and other racist forces. With gun sales nationwide at an all time high amongst whites, with a mood that is more anti-Black than any time recent, it is imperative that we organize our forces, pool our resources and prepare for war!" [Apparently quoting] Chairman Malik Zulu Shabazz, Esq. Convention Convener and Party Chairman. Obama and Media Minions Inspire Violence. Most assuredly, the tea parties are not about racism or hate. The truth is quite the opposite. The tea parties are about love; love for the greatest nation on the planet and a fervent desire not to see it transformed into something unrecognizable. The Tea Party Movement is no more complicated than that. So where did the New Black Panther Party get the erroneous idea that the tea party patriots are, as Janeane Garofalo says, "a bunch of redneck racist against a black president"? The unfortunate answer is the Obama media machine. Another Going-Away Party. [Scroll down] Last Thursday [6/3/2010], there was another going-away party in the Voting Section, this time for Christian Adams, the second Obama-administration casualty of the New Black Panther Party voter-intimidation case. Holder runs from Wolf. The indefatigable Rep. Frank R. Wolf provided plenty of fodder for today's [6/10/2010] meeting of the U.S. Commission on Civil Rights. The eight-member panel is scheduled to discuss a number of matters, including the ongoing investigation into the New Black Panther voter-intimidation incident. Pro-Black Panther prejudice. The foundation is crumbling from the Justice Department's stonewall on the New Black Panther voter intimidation case. What's becoming visible is a serious corrosion in the whole edifice of the Civil Rights Division in the Obama-Holder Justice Department. The edifice shook on Friday [6/18/2010] when a key lawyer in the case notified the U.S. Commission on Civil Rights that he is now available to testify. The lawyer, J. Christian Adams, had been ordered by his Justice Department superiors, quite improperly, to ignore a subpoena by the commission. Inside the Black Panther case Anger, ignorance and lies. On the day President Obama was elected, armed men wearing the black berets and jackboots of the New Black Panther Party were stationed at the entrance to a polling place in Philadelphia. They brandished a weapon and intimidated voters and poll watchers. After the election, the Justice Department brought a voter-intimidation case against the New Black Panther Party and those armed thugs. I and other Justice attorneys diligently pursued the case and obtained an entry of default after the defendants ignored the charges. Before a final judgment could be entered in May 2009, our superiors ordered us to dismiss the case. Unequal Law Enforcement Reigns at Obama's DOJ. Soon after his confirmation, Attorney General Eric Holder labeled us a nation of cowards, a people supposedly unwilling or afraid to discuss race. Based on my experience as an attorney at the Civil Rights Division at the Justice Department, Holder has far more to fear from that discussion than do the rest of us. If we had that frank, truthful discussion about race, we'd learn that the Obama administration doesn't believe some civil rights laws protect every American. Obama's Wonderland Is No Fairy Tale. [Scroll down] When questioned by senators about the massive expansion in hate crimes enforcement, Attorney General Holder responded that hate crimes legislation "would not necessarily cover" instances where whites, Christians, or military members were assaulted. Preferential treatment for blacks at the expense of whites and Asians was part of Obama's tenure during his time as senator. Double standards and obvious favoritism now reign supreme. Most egregious is Holder's dismissal of the case where New Black Panther Party members intimidated white voters. Holder Accused of Dropping New Black Panther Case for Racial Reasons. A former Justice Department attorney who quit his job to protest the Obama administration's handling of the New Black Panther Party voter intimidation case is accusing Attorney General Eric Holder of dropping the charges for racially motivated reasons. J. Christian Adams, now an attorney in Virginia and a conservative blogger, says he and the other Justice Department lawyers working on the case were ordered to dismiss it. Top Justice Dept. Official Lied Under Oath, Ex-DOJ Lawyer Says. A former Justice Department attorney who resigned last month in protest of the Obama administration's handling of a voter intimidation case involving the New Black Panther Party accused a top Justice official of lying under oath about the circumstances surrounding the decision to drop the case. Meet J. Christian Adams. [Scroll down] All in all, it is the kind of scandal that, if committed by a Republican administration, would be an endless source of interest among the mainstream media. As it is, to take one example, a Google News search for "New York Times New Black Panther Party Philadelphia" turns up my own post and nothing else on point. ... If this were a Republican administration, [J. Christian] Adams would be celebrated as a heroic whistleblower who put his career on the line over a matter of principle. In the Age of Obama, the crickets are chirping. Holder's Black Panther Shame. The New Black Panthers are a completely different, and more radical, organization. They are a militant black separatist organization. They are vehemently anti-Semitic. While the old black panther party had relations with like minded members of the white community, the New Black Panthers want total racial separatism. ... At their core, the New Black Panthers exist to advance a limited, militant and racial agenda. DOJ Slimes Whistleblower Adams in Panthergate Case. Call it Panthergate, call it what you will. The Department of Justice (or its minions) is already attempting to slime its whistleblower J. Christian Adams — the attorney who recently resigned from the Department over its abandonment of the New Black Panther case. Now Adams has struck back, telling Pajamas Media that the DOJ's smears were a "blatant lie." Did DOJ Try to Whitewash Black Panther Intimidation Case? On Election Day 2008, two men — identified as members of the New Black Panther Party — stationed themselves outside a polling place in Philadelphia dressed in military clothing. Videotape captured these two strolling back and forth in front of the polling place, with one clearly brandishing a nightstick. A white poll watcher testified that he was called a "white devil" and a "cracker." This poll watcher was told by one of the Panthers that he would be "ruled by the black man." Media blackout for Black Panthers. Where is the New York Times? Where is The Washington Post? Where are CBS and NBC? A whistleblower makes explosive allegations about the Department of Justice; his story is backed by at least two other witnesses; and the allegations involve the two hot-button issues of race and of blatant politicization of the justice system. A potential constitutional confrontation stemming from the scandal brews between the Justice Department and the U.S. Commission on Civil Rights. A congressman highly respected for thoughtfulness and bipartisanship has all but accused the department of serious impropriety. By every standard of objective journalism, this adds up to real news. Or it would be real news if a Republican Justice Department stood accused. It would be real news if the liberal media weren't mostly in the tank for our celebrated but failing first black president. Former U.S. prosecutor to testify on New Black Panthers charges. [J. Christian Adams] said he was scheduled to testify Tuesday [7/6/2010] before the U.S. Civil Rights Commission in an investigation over dismissal of the charges. Adams said Friday that he disagreed with the decision to dismiss charges. Though his name is on the court document seeking the dismissal, Adams said he believes the case should have been pursued. "I was just following instructions to dismiss the case," Adams said in an interview. DOJ Stonewalling Black Panthers Case. For more than a year, I have been urging the U.S. Department of Justice to release all the documents surrounding the dismissal of U.S. v. New Black Panther Party and to make a genuine attempt to answer the questions asked by members of Congress and the U.S. Commission on Civil Rights about the case. My requests have been rebuffed at each turn by the department. A Very Obama Scandal. J. Christian Adams, a former career Justice Department official who resigned over the Obama administration's failure to pursue a voter intimidation case against the New Black Panther Party, will finally get a chance to tell his story in public today [7/6/2010] when he testifies before the U.S. Commission on Civil Rights. Ex-Official Accuses Justice Department of Racial Bias in Black Panther Case. In emotional and personal testimony, an ex-Justice official who quit over the handling of a voter intimidation case against the New Black Panther Party accused his former employer of instructing attorneys in the civil rights division to ignore cases that involve black defendants and white victims. J. Christian Adams, testifying Tuesday [7/6/2010] before the U.S. Commission on Civil Rights, said that "over and over and over again," the department showed "hostility" toward those cases. New Black Panther dismissal is sleeper issue for 2010 midterms. Earlier today I had the opportunity to attend the United States Commission on Civil Rights' hearing on the U.S. Department of Justice and the New Black Panther Party litigation. The testimony by the hearing's lone witness, former DoJ lawyer J. Christian Adams, was nothing short of extraordinary. ... In no uncertain terms, Adams noted that senior officials within the Obama Justice Department had told employees that they were not to bring voting-rights cases where the alleged victim in the case was white. In other words, white transgressor and black victim, bring it on. Black transgressor and white victim? Forget about it. Whistleblower: DOJ OK's Voter Fraud to Help Dems Win Elections. This week [J. Christian] Adams told the Commission: "The [voting] section doesn't want to protect white voters." And he named names. He testified that Deputy Assistant Attorney General Julie Fernandes told Voting Section management that there would be no more cases brought against black defendants vindicating the rights of white victims. More on the DOJ and the New Black Panther Voting Scandal. It took the mainstream media nearly a year to catch up. ... It would be good if other media organizations jumped in and started trying to grill Obama officials. It is, after all, a rather important issue: Does the Obama team think only some Americans are deserving of the protection of federal law? Reverse discrimination in New Black Panther case. Surely President Obama does not support the U.S. Department of Justice's outrageous decision to drop prosecution of the most blatant example of voter intimidation likely ever caught on video, the New Black Panther case in Philadelphia in 2008. Obama needs to tell Attorney General Eric Holder to reverse the decision before this thing explodes into a scandal of epic proportions. I beg to differ with the author of the article above. I suspect that Mr. Obama supports the DOJ decision to drop the case; in fact, I suspect that it was his idea. Black Panther case: Racism rules. Former Justice Department lawyer J. Christian Adams made explosive allegations yesterday in testimony to the U.S. Commission on Civil Rights, saying that a particular Justice Department official openly announced that civil rights laws would not be enforced to protect white voters. He also said he saw race-based harassment within the department itself. New Black Panthers harassed black GOP'er too. U.S. Civil Rights Commissioner Ashley Taylor told Fox News anchor Megyn Kelly that it was not just white voters who were intimidated by the New Black Panthers in Philadelphia during the 2008 election year. He talks about a black Republican poll watcher who was also harassed by the Black Panthers who were standing in front of a Philadelphia polling station. Why isn't the media covering the paramilitary aspect of the Black Panther case? Why, in all the media coverage of the Black Panther voting intimidation case, is no one, and I mean absolutely no one, even in the conservative media, addressing the paramilitary aspect of this issue, where jackbooted, black thugs wearing leather jackets and badge-adorned, black berets, obviously intend to communicate through their uniform appearances a menacing solidarity of purpose? Does not the wearing of those uniforms imply the ominous and looming presence of a more widespread and more frightening paramilitary organization to the voters of that precinct? Civil Rights Panel to Renew Subpoenas, Pursue Federal Probe in Black Panther Case. The bipartisan panel investigating allegations that the Justice Department wrongly abandoned a case against the New Black Panther Party plans to issue a new round of subpoenas and call for a separate federal probe following explosive testimony from an ex-Justice official, a commissioner said. As the case heats up, members of the U.S. Commission on Civil Rights may even travel to South Carolina to track down one witness. The black klan: Obama protects the racists who back him. J. Christian Adams, a former Department of Justice (DOJ) attorney, is blowing his we-the-people whistle on DOJ (Devils Oblivious to Justice) after it dropped all charges against the members of the New Black Panther Klan who were blatantly and irrefutably guilty of voter intimidation in Philadelphia in 2008. The egregious, craven tactics of the New Black Panther Party Klan were caught on video. One of the racist punks is carrying a pipe or stick of some type with the clear intent of intimidating voters attempting to enter the Philadelphia voting location. How Obama Used an Army of Thugs to Steal the 2008 Democratic Party Nomination. Think those billy club armed New Black Panther thugs in Philadelphia were the first time Obama used Stalinist tactics to intimidate voters and disenfranchise the American people? Think again. In testimony this week before Congress, former Justice Department Official J. Christian Anderson revealed that not only were similar claims "pervasive", but Obama activists committed the "same" crimes during the 2008 Democratic primary to help then Sen. Obama defeat Democratic heir apparent Hillary Clinton. Is Obama 'faithfully executing' the laws? Article II, Section 3 of the Constitution demands that a US President "shall take care that the laws be faithfully executed." Hence, the President is not only the Commander in Chief he is also the Chief Executive Officer and Chief Law Enforcement Officer. Obama has failed his duty to faithfully execute the nation's laws in breathtaking cases for purely political reasons. The New Black Panther voter intimidation case was ignored despite the overwhelming evidence of criminality caught on tape. Not since Democrats wore the white sheets of the KKK have voting rights been so openly violated. Whitewashing Black Racism. Why haven't national media outlets reported on the vile and violent rants of the New Black Panther Party (NBPP) thugs whose 2008 voter intimidation tactics got a pass from the Obama administration? Simple: Radical black racism doesn't fit the Hope and Change narrative. There's no way to shoehorn Bush-bashing into the story. And, let's face it, exposing the inflammatory rhetoric of the left does nothing to help liberal editors and reporters fulfill their true calling — embarrassing the right. New Black Panther's Shabazz: Fox News Stoking Racial Fears. New Black Panther Party Chairman Malik Shabazz told a Russian TV reporter that Fox News should be ashamed of themselves and that the charges of voter intimidation leveled against them by the Justice Department had no merit. Up Holder-ing Justice! What happened to Attorney General Eric Holder's statements that he was going to pursue civil rights? Didn't Holder call us a "nation of cowards" for failing to protect the rights of all Americans? In light of the Justice Department's recent actions, Holder's words ring hollow and partisan. His team seems to be applying the rule of law selectively according to his ideology, instead of objectively. Team Obama turns blind eye to voter intimidation. Voters at a precinct on Philadelphia's Fairmont Street witnessed unusual sights and sounds on Election Day Nov. 4, 2008. Two members of the New Black Panther Party, King Samir Shabazz and Jerry Jackson, stood within 15 feet of this polling station dressed in military-style black jackets, black berets and black combat boots. King Samir Shabazz wielded a 2-foot-long night stick. "Cracker, you are about to be ruled by a black man," one of the New Black Panthers told a white voter. They taunted others as "white devils." A black couple who served as Republican poll watchers said they felt endangered when the Panthers called them "race traitors." New Black Panther Leader Defends Group in Voter Intimidation Case. The chairman of the New Black Panther Party, in an interview Friday [7/9/2010] with Fox News, defended his group amid an uproar over a voter intimidation case dropped by the Obama administration, a move that an ex- Justice Department official alleges was for racial reasons. Holder's Justice Department Still Silent. The Justice Department has seen fit to drop voter intimidation charges against Malik Shabazz' New Black Panther Party's involvement in the now infamous events at a polling place in Philadelphia on November 4, 2008. In light of the recent testimony by former DOJ attorney J. Christian Adams before the U.S. Civil Rights Commission, the story is gaining further attention and scrutiny. White House 'Thumbing Its Nose' at Voter Rights. In an interview with Fox News' Megyn Kelly on 'America Live,' [Karl] Rove accused White House Press Secretary Robert Gibbs of "not telling the truth" when he said Thursday [7/8/2010] that he was not looking into allegations that the DOJ wrongly dismissed a case against the New Black Panther Party. He also accused the administration of "thumbing its nose at one of the most essential rights Americans have." "Of course they're aware of this," Rove said. "I can't imagine that when the attorney general makes such a controversial decision, that they would have not discussed this with the White House." The Beneficiaries of Holder's Favoritism. No doubt factors other than racism could be brought forward to explain Holder's decision, but at the moment I can't quite think what they would be. Video: New Black Panthers grateful to Holder for 'payback time'. Leaders of the New Black Panther Party express joy in a newly available video that Attorney General Eric Holder tolerated their voter-intimidation activities and dropped a case against them. Hayes Calls for A.G. Holder to Step Down. Republican nominee for Illinois 2nd Congressional District Isaac Hayes released [a] statement calling for Attorney General Eric Holder to resign after failure to prosecute the New Black Panther Party for voter intimidation during the 2008 election. Video Surfaces Of New Black Panther Party President Praising Bin Laden In 2002. This Black Panther just keeps getting more and more absurd. New Black Panther Party head Malik Zulu Shabazz burst onto the scene with some strongly-worded messages to Glenn Beck and a interview with Fox News' Megyn Kelly and has usurped BP CEO Tony Hayward's place as this summer's most disliked non-celebrity in some circles. And now, video has surfaced of Shabazz praising Osama Bin Laden in 2002 for "not bowing down" to America. Deliberate Nonfeasance at the DOJ. According to J. Christopher Adams, who recently resigned from the DOJ and has been testifying in front of the U.S. Civil Rights Commission — which the department had forbidden him to do when he was an employee, despite a subpoena — the Deputy Assistant Attorney General Julie Fernandes told the Voting Rights Section at a meeting that, "We have no interest in enforcing this provision of the law. It has nothing to do with increasing turnout, and we are just not going to do it." Nothing equivocal about that. Indeed, it's a plain and simple statement that the Obama Justice Department intends to commit nonfeasance regarding the enforcement of this provision of a duly enacted law. But that, of course, puts Ms. Fernandes and her boss, Eric Holder, in flat violation of their oaths of office. A Third Former DOJ Official Steps Forward to Support J. Christian Adams. Several former DOJ employees have been in contact with Pajamas Media, interested in publicly supporting J. Christian Adams as he comes forward about the DOJ's failure to enforce the country's laws from a race-neutral perspective. These former DOJ employees have expressed a willingness to go on record regarding Adams' professionalism, excellent performance, and outstanding record of enforcing the law without racial bias. Additionally, they would like to corroborate Adams' statements about the DOJ. New Documentary Alleges That Obama Stole The Primary Election From Hillary. Amidst recent charges that the New Black Panther Party intimidated voters outside a Philadelphia polling place in 2008, a new documentary called We Will Not Be Silenced charges that this was not an isolated incident. The film's director Gigi Gaston appeared on Fox and Friends this weekend and was introduced by host Alyson Camerota who claimed that "the 2008 primary race between Barack Obama and Hillary Clinton was rife with stories of voter intimidation and voting violations." We Will Not Be Silenced. This documentary is about the disenfranchising of American citizens by the Democratic Party and the Obama Campaign. We the People have made this film. Democrats have sent in their stories from all parts of America. We want to be heard and let the country know how our party has sanctioned the actions of what we feel are Obama Campaign "Chicago Machine" dirty politics. We believe this infamous campaign of "change" from Chicago encouraged and created an army to steal caucus packets, falsify documents, change results, allow unregistered people to vote, scare and intimidate Hillary supporters, stalk them, threaten them, lock them out of their polling places, silence their voices and stop their right to vote, which is, of course, all documented in "We Will Not Be Silenced." Charges That Obama Stole the Nomination From Hillary Clinton. Maybe the New Black Panther intimidation case is not an isolated event. This could be the tip of a very large iceberg. Live On Fox: Geraldo Rivera Takes Apart Malik Zulu Shabazz. Shabazz is (so to speak) a pale imitation of his fiery forebears, but still spouting the same tiresome, second-hand communist-inspired separatist resentment and hate that could only be expressed by someone who has never had any real obstacles put in his way. (He's a lawyer, for crying out loud.) It's an act, a sham, but a dangerous one, and Geraldo is right to call him out on it. Megyn Kelly And Kirsten Powers Epic Battle Over New Black Panthers. Megyn Kelly and Kirsten Powers got into a remarkably heated battle today over the merits of the case against the New Black Panther Party intimidating voters outside of Philadelphia and more to the point, the case's dismissal by the Justice Department. In [a Fox News Channel] segment, Kelly aired amateur footage of Congressman Brad Sherman (D-CA) admitting during a Town Hall meeting that he was not aware of this case, leading to audible cries of disbelief from his constituents. She then followed with a panel discussion about the case at large with Andrea Tantaros and Powers ... and then all hell broke loose. DOJ Official Responsible for Black Panther Outrage. A situation involving voter intimidation caught on tape has now exploded, as a Justice Department lawyer resigns to be able to tell the truth to the American people that the Obama-Holder Justice Department is allowing voting-rights violations to go unpunished for political reasons. Those responsible must be made to answer for their betrayal of the public trust. Leftist Media Attempts to 'Swiftboat' DOJ Discrimination Scandal. Today, there's the potential for a real scandal brewing in President Obama's Department of Justice regarding the charges Attorney General Eric Holder dropped against the New Black Panther Party for what might be the most obvious case of voter intimidation we've seen in the last 20 years. We also have a whistle-blower from the DOJ, a man named J. Christian Adams, who says that word came down from above to "Never bring another lawsuit against a black or other national minority, apparently no matter what they do." Obviously this is a very serious charge of outrageous discrimination that could do great damage to an already embattled and increasingly unpopular Obama Administration. So naturally the MSM has not and does not want to go anywhere near it — just like they didn't the ACORN story or Van Jones. 'Downgrading' Voter Intimidation. [J. Christian] Adams confirmed many of the details that I have reported for National Review over the past year, and Megyn Kelly of FOX News has done an outstanding job further exposing the sordid and frankly infuriating particulars of the politically biased and pernicious actions taken by the political leadership at the DOJ, as well as the hateful, racist, and anti-Semitic views of the members of the New Black Panther Party. Congressman Says He Didn't Know Black Panther Case Because Media Didn't Cover It. Rep. Brad Sherman, D-Calif., in a written statement released late Tuesday, accused Fox News of launching "attacks on me" for showing video of the meeting. He said he would soon send a letter to Attorney General Eric Holder regarding the incident and "the importance of allegations of voter intimidation," but said the "major sources of information which I rely upon most" did not mention the issue. But he also offered an excuse for missing the news, saying none of the media he reads covered it. Let's give him the benefit of the doubt and accept the idea that he really didn't know about the Philadelphia case. But really, if you're a Congressman, you really should not get all your information from MSNBC and the Washington Post. The New Black Panther Party Are the Real Racists. I condemn the NAACP. Instead of criticizing tea parties, the NAACP would be better served denouncing the racist comments made by a member of the New Black Panther Party and its voter intimidation outside a Philadelphia polling place in the last presidential election. As a frequent speaker at tea party rallies around the country, I can assure the NAACP that the tea party movement's concerns are about President Obama's policies and not his race. NAACP Direct Tie to Black Panthers. In the past 24 hours [7/14/2010], more than a few pundits and writers have noted that the NAACP resolution accusing Tea Partiers of racism is hard to swallow when the NAACP seems unconcerned with the New Black Panther voting intimidation case. Their points would be valid by analogy only. Their points are even more valid, though, because of a direct, rather than just analagous, tie between the NAACP and the Panther case. Panel Urges Federal Probe Following 'Grave' Testimony in Black Panther Case. The commission probing allegations that the Justice Department wrongly abandoned a case against the New Black Panther Party has formally called for a federal investigation into claims that the department's Civil Rights Division will not pursue black defendants. In a letter sent Wednesday to Assistant Attorney General Thomas Perez, the chairman of the bipartisan commission said testimony last week from an ex-Justice official raised "grave questions" about whether the division is "color blind" in its enforcement of the law. New Black Panther Case Spurs Civil Rights Commission to Challenge DOJ. Ratcheting up a growing controversy over how the Obama Administration enforces civil rights and voting rights laws, the U.S. Commission on Civil Rights said today it has evidence of "possible unequal administration of justice" within the Justice Department, citing testimony that revealed widespread, "pervasive hostility" against discrimination and voter intimidation claims by whites. In a sharply worded letter to senior Justice Department official Thomas Perez, who heads the Civil Rights Division, the commission said it had evidence raising "serious concerns" about whether the department's policies "are being pursued in a race-neutral fashion." Black Panthers' Troubled History. Christian Adams isn't the only one scratching his head over politics trumping justice in the Election Day 2008 voter intimidation case. If New Black Panthers standing outside of a Philadelphia polling place in paramilitary garb, striking menacing poses, swearing at passers-by, and, in one instance, swinging a club, isn't voter intimidation, then it's hard to envision a case — short of outright assault — that would be. Racialist Justice. By now, the default judgment about the Barack Obama-Eric H. Holder Jr. Justice Department is that it discriminates intentionally on the basis of race. By the precise definition used in the American Heritage dictionary, the department is racialist. ... Mr. Holder called America a "nation of cowards" on racial issues and has said black solidarity should bind black prosecutors and criminals together. These are not signs of equal justice. They are signs of a racial spoils system that's lawless and dangerous. Turning the Department of Justice into the Department of Agendas. One of the signal and fundamental principles of a successful democracy is the rule of law. No one is exempt, it is applied fairly and it refuses the intrusion of politics or selective application of the law. That's the way it is supposed to be. Unfortunately that's not the way it is, at least for the moment. Panthers. Racial prejudice is ugly. I never knew how ugly until I was on the receiving end. Why Won't the Media Cover the Black Panther Scandal? [Scroll down] Blacks, you see, cannot be racist or deny the civil rights of whites — or presumably those of any other race — because of their history of oppression in America, according to the politically correct dictum Marxist political science professor Herbert Marcuse embedded in the minds of our liberal intelligentsia during the '60s. That's important because the agenda-setting media is controlled by those politically correct elite. "Agenda-setting media," by the way, is Marxist MIT linguistics professor Noam Chomsky's term for that portion of media that have a large influence on public opinion and public policy by their choice of stories, the language and images used to tell those stories. The Voter Intimidation Case and the Blind Eye. There is much more to the case — and it would have doubtless triggered breathless investigations from the New York Times and other mainstream media outlets had similar things occurred under a Republican administration. Don't Give Me the Facts, I've Got My Story. I'm amazed how Politico can run a story trying to debunk the New Black Panther scandal without interviewing trial team member Christian Adams or any other former or current Justice Department attorney, without relating any of Adams's testimony, without referencing the voluminous research and evidence unearthed by other news outlets, without contacting the offices of congressmen (Reps. Lamar Smith and Frank Wolf) who have been pressing for answers from the administration, and without even mentioning the allegations that the Justice Department won't file civil rights cases against minorities. For over a year, Politico — as well as every other mainstream outlet — ignored the story, so the name of the game, I suppose, is to explain that they didn't miss anything. Unsatisfactory Answers on the New Black Panther Case. Both the Washington Times and National Review have been covering this story for the past year while the New York Times and the Washington Post ignored it. Bob Schieffer claimed he didn't know about the case. He was on vacation when the story exploded back into the headlines after J. Christian Adams testified before the U.S. Commission on Civil Rights, and that's why he didn't ask Attorney General Holder any questions about it. I guess all of the producers, researchers, and writers who work for him must have been on vacation, too. How Politico & WaPo Memory-Hole a Story They Wish Would Go Away. Because search engines are imperfect and I spend most of my waking hours in Hollywoodland, I'm uncomfortable stating outright that Politico has declared a complete news blackout on the DOJ discrimination story. But I am comfortable stating that a good faith search would lead any reasonable person to come to that conclusion. Regardless, what is quite obvious is that Politico doesn't consider the DOJ story anywhere near as important as a private citizen's tax records and their standing as a licensed plumber. The Case Against the New Black Panthers. [Abigail Thernstrom has] apparently decided that her eyes deceived her. It no longer matters to Thernstrom what the Panthers were doing in front of that Philadelphia polling station because, after all, it was a majority-black precinct that had voted overwhelmingly for Democrats in previous elections. That, she told the Washington Post, would not have been a prime spot for intimidating white voters. Memo to Thernstrom: That would be the prime spot for intimidating white voters. Gangsters maraud in the places where they know that the community has been cowed, not where it is likely they will meet resistance and law enforcement. Liar, liar: Why Obama is failing. [Scroll down] Now we are where we are. We have a president that no one wants to listen to because we do not fully believe him. His own party is deserting him not just because they know his ideas are unpopular. They also know he is unable to convince anyone. We have shut him off. And now the revelations of J. Christian Adams have shown that his Department of Justice has a racial bias not entirely dissimilar to those of Reverend Wright. Again the MSM is doing its best to ignore this, but the damage is still there and growing and Obama will not be able, this time, to make a speech in his defense. A War amongst Ourselves. One brave American stood up. J. Christian Adams, a former lawyer for the Justice Department, kept the case alive. He pointed out that the "1965 Voting Rights Act protects voters from voter intimidation. You're supposed to be able to go vote without somebody with a weapon shouting racial slurs at you like these folks were doing in Philadelphia. ... they said, 'You're about to be ruled by the black man, Cracker.' They called people 'white devils.' They menaced, they tapped their baton. They tried to stop people from entering the polls." Adams charged that the Justice Department was now declining to prosecute cases if the defendants were black and the victims white, and said, "It's the easiest case I ever had at the Justice Department. It doesn't get any easier than this. If this doesn't constitute voter intimidation, nothing will." Raising the Stakes in the New Black Panther Case. [Scroll down] As the senators correctly observe, if these allegations are true, the "Civil Rights Division is actively engaged in widespread politicization and possible corruption" and the Judiciary Committee has a duty to investigate allegations "that strike at the heart of the Department's integrity." The senators also say that holding a hearing on this issue "should take priority over other Committee business." Why the Left Shouldn't Defend the New Black Panther Dismissal. Since my testimony before the Civil Rights Commission under oath on July 6 about various corrupt policies relating to enforcement of election law at the Department of Justice, the left-wing soldiers on the internet have marched into action. They have made personal attacks and made multiple factual errors in defending the dismissal. This is unfortunate, because they are harming a cause they profess to support — the right to vote. In their reflexive personal attacks and amateurish legal arguments, they fail to see they are undermining their own long-term goals, namely vigorous enforcement of voter intimidation and civil rights laws. Rep. Smith: Is Justice Department ignoring voter intimidation against whites? Yesterday [7/23/2010], Rep. Lamar Smith, R-Texas, published a letter to President Obama calling for a special investigation into the Department of Justice decision to dismiss the voter intimidation case again the New Black Panther Party. Based on testimony of J. Christian Adams, the former Department of Justice attorney who worked on the New Black Panther case, Smith is concerned that "the Department has adopted a policy of enforcing voting rights laws in a racially discriminatory manner." How the Mainstream Media Misses the News. For a year, a small number of conservative media outlets have been reporting on the New Black Panther Party scandal — a slam-dunk voter-intimidation case documented on videotape, which the government won by default but that Obama administration appointees ordered career lawyers to dismiss against the NBPP and two individual defendants. ... The liberal media, meanwhile, ignored the story even though the allegations were explosive. 'We Will See Caskets and Funerals in the Community of our Enemy'. [Malik Zulu] Shabazz has appeared on Fox News, issued a statement through CNN, and done exclusive interviews for various media outlets. The Anti-Defamation League has described Shabazz as anti-Semitic and racist, trying "to recast himself as a serious civil rights leader in recent years by cloaking his bigotry and intolerance in religious and civil rights principles and inserting himself in high profile, racially charged issues around the country." This certainly seems to be the case as he has made an increasing number of appearances in the media, in which the audience is to suspend belief and assume this man is an evenhanded voice on race relations in America. Why won't the Justice Department let Christopher Coates testify? J. Christian Adams, a former Department of Justice official, has gained a lot of media attention as a whistle-blower in the dismissal of the New Black Panther Party (NBPP) voter intimidation case. His testimony before the U.S. Commission on Civil Rights has raised a great deal of concern and questions about the current racial mandates at the Civil Rights Division of the Justice Department. Sen. Leahy (D-VT) Denies Senate Judiciary Request to Investigate. As the scandal over the dismissal of the New Black Panther Party (NBPP) voter intimidation case percolates in the media, letters have been flying through the corridors of power. On July 22, Rep. Lamar Smith (R-TX) sent a letter to President Obama demanding that he appoint a special counsel to look into the Justice Department's handling of the case. Panthers probe heats up panel. The federal government's dismissal of voter intimidation charges against the New Black Panther Party has not only stirred debate at the national level and among various media outlets, but created a firestorm within the U.S. Commission on Civil Rights, which has announced a separate investigation of the matter. U.S. Civil Rights Commission hearing erupts in shouting. Members of the U.S. Civil Rights Commission shouted at each other Friday [8/13/2010] over the Justice Department's decision to drop most of the charges in a 2008 incident in which black militants confronted voters at a Philadelphia, Pennsylvania, polling place, leading to charges of voter intimidation. Voting Rights... for Some. The mainstream media have recently discovered the misdeeds of the voting section of the Obama Justice Department. But the dismissal of an egregious case of voter intimidation against the New Black Panther party (over the objections of the veteran trial team) by Obama political appointees and the refusal to enforce Section 2 of the Voting Rights Act (requiring voting rolls be reviewed and updated to prevent voter fraud) is just the tip of the iceberg. Justice stiffs Civil Rights Commission. The hypocrisy of the Obama Justice Department has reached staggering proportions on a host of issues stemming from the New Black Panther voter-intimidation case. Such systemic evasion of justice breeds lawlessness. Time for transparency in New Black Panther case. This case matters. What's at stake is the fair and honest administration of justice, something the Obama administration seems to regard all too lightly. If, as Adams testified, Obama's Justice Department consciously ignores voting rights violations allegedly committed by minorities, that is a big deal. We need transparency now, to restore faith in government. We need to hear from Coates and others about why such clear-cut wrongdoing only merited dismissals and a wrist-slap. Obama Sues Pro-Life Protester. A West Palm Beach, Florida pro-life leader is proclaiming her innocence after U.S. Attorney General Eric holder filed a lawsuit alleging she violated federal law prohibiting individuals from blocking clients from entering abortion clinics. Justice IG probing Black Panther case. The Justice Department's Civil Rights Division — in the wake of the New Black Panther Party case — is being investigated by the department's office of inspector general to determine whether voting section employees have been harassed for participating in specific investigations or prosecutions. In an end run around policy barring IG investigations of Justice Department litigators, Inspector General Glenn A. Fine said his office will review what types of cases are being investigated, whether there have been changes in enforcement policies and procedures, and whether the civil rights laws are being enforced in a non-discriminatory manner. Holder smacked down over voting. The Justice Department's Civil Rights Division has lurched from multiple controversies into an outright embarrassment. In an order issued Sept. 16, U.S. District Judge John D. Bates of the District of Columbia gave Attorney General Eric H. Holder Jr.'s team the legal equivalent of a 2-by-4 across the head. The department's handling of a voting rights case from Shelby County, Ala., has been so slipshod as to invite questions of its legal competence across the board. New Records Show DOJ Lied About New Black Panther Dismissal. Judicial Watch made an explosive announcement today [9/20/2010] about the Justice Department's stonewalling in the New Black Panther voter intimidation case dismissal. Forced to bring a Freedom of Information Act (FOIA) lawsuit after DOJ rebuffed its public records request (so much for transparency), Judicial Watch obtained a privilege log from the DOJ last week. It shows — in a rather dramatic way — that the DOJ has been untruthful about who was involved in the dismissal of the case. Did DOJ Misrepresent Disposition of New Black Panther Case? The Department of Justice and liberal media have argued that the controversy over the Department's dismissal of its voter intimidation case against the New Black Panther Party — after the case had already been won by default — is much ado about nothing. DOJ's position has been that the decision to drop the case was made by "the top career attorneys in the Civil Rights Division," solely on the basis of the merits of the case. Considerable doubt has been cast on that claim, however, by the privilege log DOJ produced last week in the Freedom of Information Act case brought by Judicial Watch. Obama politico involved in New Black Panther decision. Democratic election lawyer and Obama political appointee Samuel Hirsch was deeply involved in the Justice Department decision to drop the federal prosecution of two Philadelphia New Black Panthers for voting rights violations in the 2008 president election, according to documents identified by Judicial Watch. Truth, Justice, or the Obama Way. It is about to get harder for both the Obama administration and the mainstream media to downplay the New Black Panther party scandal. The mainstream media did their best to ignore this blatant case of voter intimidation by two New Black Panther party members at a Philadelphia polling place on Election Day 2008. Though the threatening behavior was captured on videotape, Obama political appointees dismissed the case on the eve of a default judgment. Black Panther case roars back to life. Thomas E. Perez, assistant attorney general for civil rights, is in big trouble. The public-interest group Judicial Watch yesterday released a 62-page index of documents regarding the New Black Panther Party voter-intimidation case that undermines the credibility of Mr. Perez and of the Department of Justice under Attorney General Eric H. Holder Jr.
Black Panthergate. Their conduct was so egregious that the Justice Department of President Bush charged the three thugs with violations of the 1965 Voting Rights Act through intimidation, threats and coercion. When none of the defendants filed a response or showed up at a subsequent hearing, you'd have thought the Justice Department would have won its suit by default. But a new administration brought a new, and somewhat jaundiced, perspective. Instead, the Justice Department of President Obama essentially dropped the case in May 2009, letting two of the three walk and issuing a weak injunction against King Shabazz. Which Malik Shabazz Visited White House in July 2009, Mr. President? In May 2009, the Obama/Holder Justice Department dropped charges in a voter intimidation case against Malik Shabazz, a leader of the New Black Panther Party, despite having already won a summary judgment against him, and his New Black Panther Party colleagues King Samir Shabazz and Jerry Jackson who were video-taped outside polling place in Philadelphia intimidating voters as they arrived on election day, 2008. In July 2009, when Congress began looking into the matter, someone named Malik Shabazz visited the private residence at the White House. Federal prosecutor accuses Justice Dept. of reverse racism. The Justice Department supervisor who recommended pursuing a voter intimidation case against members of the New Black Panther Party testified Friday [9/24/2010] that the department's Civil Rights Division has engaged in reverse racism, refusing to bring charges in voting cases unless the victim is a minority. Christopher Coates takes the stand. Former Department of Justice voting rights section chief Christopher Coates testified this morning before the Civil Rights Commission regarding the department's disposition of the case against the New Black Panther Party. Coates disobeyed the instruction of his superiors in order to testify and claimed whistleblower protection for his testimony. Full Text of Christopher Coates' Testimony to U.S. Commission on Civil Rights. Coates Negates a Year of Justice Department Spin on New Black Panther Case. It has been a very bad week for the dwindling number of people defending the dismissal of the voter intimidation case against the New Black Panther Party by Eric Holder's Justice Department. Today might have been the worst day of all. Former Voting Section Chief Christopher Coates testified to the United States Civil Rights Commission that Obama political appointees dismissed the case because they are opposed to enforcing civil rights laws in a racially neutral fashion. And that was just the beginning. Voting Rights Official Calls Dismissal of Black Panther Case a 'Travesty of Justice'. The Justice Department is ignoring civil rights cases that involve white victims and wrongly abandoned a voter intimidation case against the New Black Panther Party last year, a top department official testified Friday. He called the department's conduct a "travesty of justice." Christopher Coates, former voting chief for the department's Civil Rights Division, spoke under oath Friday morning before the U.S. Commission on Civil Rights, in a long-awaited appearance that had been stonewalled by the Justice Department for nearly a year. Wolf Protects Panther Case. Chris Coates is the former ACLU attorney and highly decorated civil rights lawyer, a career veteran at the Department of Justice, who now is putting his job on the line to testify about the Panther case despite an (illegal) order from DoJ for him not to testify. Coates is an honest man. He will be testifying under oath. This is a big deal. New Black Panther Party voter intimidation case: 'Bombshell' for Obama? When Department of Justice attorneys traveled to investigate a voter intimidation allegation against a black politician in Mississippi's Noxubee County in 2006, one civil rights staff attorney commented, "Can you believe we're going to Mississippi to protect white voters?" To Christopher Coates, the former head of the Department of Justice's voting rights section, the comment was more than just an attempt at irony — it was evidence that something was going wrong in the department. Black Panther case: Red hot. Assistant Attorney General Thomas E. Perez has an obligation to clean house at the Justice Department's Civil Rights Division. That's clear after explosive new whistle-blower testimony under oath Friday [9/24/2010] in the New Black Panther Party voter-intimidation case, which triggers a pledge Mr. Perez made under oath on May 14. Failure to fire some officials and to radically revamp practices in the Civil Rights Division would represent clear dereliction of duty by Mr. Perez. 'An Environment of Hostility Toward Race Neutral Enforcement'. [Scroll down] Now with the testimony of Christopher Coates, on top of the testimony of J. Christian Adams we learn that under the administration of Barack Obama, the Department of Justice has little interest in enforcing voting rights for all, just those who are of a certain skin pigmentation and those for whom English is a second language. The Obama administration has been criticized because many of its programs such as are designed to redistribute income. Frighteningly, the policy of the DOJ seems designed to redistribute voting rights by singling out one group whose rights are forbidden to be protected. If true, than this is the most racist presidential administration the United States has had in many decades. Obama Justice Department Rocked. The former head of the Justice Department's New Black Panther trial team, Chris Coates, testified Friday [9/24/2010] before the U.S. Commission on Civil Rights. ... Before Coates broke his silence, the commission's critics, a minority of the commissioners, and the mainstream media insisted that the dismissal of a slam-dunk voter-intimidation case had no significance beyond the single incident on Election Day 2008. However, Coates's account of the administration's hostility to race-neutral enforcement of voting laws and refusal to enforce Section 8 of the Voting Rights Act (requiring that states clean up their voting rolls to prevent voter fraud) blew that assertion to smithereens. Travesty Of The Justice Department. Those who thought hope and change meant equal enforcement of the law were wrong. A top DOJ official testifies about a deliberate policy of not prosecuting minorities or protecting the rights of anybody else. Investigate Racism in the Obama Justice Department. While commentators have sought to downplay the scandal over DOJ's dismissal of the New Black Panther party voter-intimidation case, even the liberal media is becoming too embarrassed not to take notice of this injustice. That owes to last week's explosive testimony by Christopher Coates, a decorated veteran lawyer and supervisor in DOJ's Civil Rights Division. The Wrongdoing, the Cover-Up, and Executive Privilege. The wrongdoing is not merely that the Obama administration dismissed a blatant case of voter intimidation. It is not merely that an NAACP attorney pressured the Obama team to dump the case. It is not merely that the Obama Justice Department explicitly told attorneys not to enforce Section 8 of the Voting Rights Act, which helps prevent voter fraud. It is that the Obama team believes that the civil rights laws run only one way and offer protection only to certain racial or ethnic groups. 'Post-Racial' Racialism. In the New Black Panthers case, Justice refused to protect the rights of white voters. Two career prosecutors have now sworn that high-level Obama appointees running the Civil Rights Division scuttled an open-and-shut case of voter intimidation against nightstick-wielding black thugs at a Philly poll in 2008. They also testified that the division has a do-not-prosecute policy if victims are white and offenders black. If that bias weren't bad enough, check out what's going on in the division's housing and civil enforcement section. Justice and the New Black Panthers. A former chief of the voting section in DOJ's Civil Rights Division, [Christopher] Coates had inside knowledge that the commission was eager to hear. It was seeking an answer to a core question in the case: Why did the Justice Department decide it sufficed to obtain an injunction against only one Panther — King Samir Shabazz, the man with the nightstick? The injunction forbids Shabazz to display a weapon within 100 feet of an open polling place on any election day in Philadelphia — but only until November 15, 2012. And no penalty was imposed on his companion, Jerry Jackson, or on the organization itself. Coates delivered a simple message: The Obama Justice Department is not interested in aggressively pursuing cases in which the defendants are black. The department, Coates said, believes the Voting Rights Act protects black, but not white, voting rights. Black Panthers case: "A travesty of justice", says former DOJ chief. President Barack Obama's handpicked U.S. Justice Department officials are ignoring civil rights cases in which the alleged victims are whites and they abandoned a voter intimidation case against the New Black Panther Party that resulted in a "travesty of justice." New Developments in New Black Panther Party Voter Intimidation Case. For nearly a year and a half, I have been urging the Department of Justice to come clean about the circumstances surrounding the dismissal of the U.S. v. New Black Panther Party voter intimidation case. This important case was dismissed over the unanimous objection of the four career attorneys on the trial team and career officials in the department's appellate office, including its chief. I continue to be troubled by the inexcusable conduct of the DOJ as well as the obstruction and stonewalling by Atty. Gen. Eric Holder and other political appointees at the department. No black hole for Black Panthers. The Obama Justice Department can put an end to the scandal surrounding the New Black Panther voter-intimidation case. All Attorney General Eric H. Holder Jr. would have to do is allow members of his Voting Rights Section to answer a few simple questions under oath, without waiving a single legal privilege. Vote for Restoring the Rule of Law in November. Since the Obama administration assumed control, is has become clear to many Americans that the equal application of law has been completely undermined by "Chicago way," progressive political considerations. ... In Philadelphia, during the 2008 election, three men dressed in para-military clothing, one of whom was brandishing a club, were videotaped harassing voters. Two prominent members of the Justice Department, former Voting Rights Section member J. Christian Adams, and that section's former chief, Christopher Coates, both testified under oath that dropping the case was completely unjustified. Both men further testified that Justice Department officials were biased against pursuing any cases involving minority defendants. The New Black Panthers Make the "News". We haven't yet written anything about the Washington Post's story on the New Black Panthers case. The Post's account, which highlights a schism in the Justice Department over whether enforcement of the civil rights laws should be race-neutral, is certainly interesting, but unless I am missing something it contains little that has not been widely reported and discussed in the conservative press. So if the Post's account is significant, it is mostly because it ran in a liberal newspaper. Time for Heads to Roll Over New Black Panther Dismissal. The many Department of Justice officials behind this debacle should be very nervous about a front-page Washington Post article. Black Panther blackout. The U.S. Commission on Civil Rights votes tomorrow [10/28/2010] on its report regarding the Black Panther voter-intimidation case. The Obama administration's malfeasance in this scandal is becoming impossible to avoid — even for the White House's most reliable defenders. Black Panthers Going Back to Polls. The controversial conservative group King Street Patriots is fighting back. The group has been accused of voter intimidation in Harris County by the Texas Democratic Party and Congresswoman Sheila Jackson Lee. Members of the Patriots say they're actually the victims. Civil rights panelist walks out of New Black Panther probe. A Democratic member of the U.S. Commission on Civil Rights walked out of the panel's meeting Friday [10/29/2010] to block acceptance of a report critical of the Justice Department's handling of a voting-rights investigation involving the New Black Panther Party. Commissioner Michael Yaki Michael said the report, the product of a year-long inquiry into the 2008 case, was "cooked" by conservative members of the panel's majority to "lay an indictment against the Obama administration." Flashback: Houston New Black Panther Party Protests with Machine Guns. The Houston chapter of the New Black Panther Party has announced that it will be sending members to the polls in Harris County on Tuesday, November 2nd. The mobilization has caused some concern for members of the King Street Patriots, a group of citizens who have been monitoring polls in Harris County. The group claims they have been the victims of harassment from County election workers and members of the Democrat Party. They believe the Black Panthers have one goal: intimidate their members. New Black Panther Voter Intimidation in Houston. A videotape of a poll worker in Houston's #202 precinct has corroborated reports received by Pajamas Media of voter intimidation today in the Texas city by the New Black Panther Party. The New Black Panthers have been at the center of the controversy surrounding a dropped prosecution by the Department of Justice that is being investigated by the US Civil Rights Commission. New Black Panthers Commit Outrageous Violations of Texas Voting Law. Everything old is new again. The New Black Panthers were again in Philadelphia — with former defendant Jerry Jackson once again perched at the entrance to a poll. He engaged voters, some of whom were not so happy about it. But Philadelphia wasn't the only American city graced by the presence of New Black Panthers today. They were also active in Houston. Texas law prohibited the New Black Panthers from bursting into a polling place. They are not allowed within 100 feet of the polls for any reason except to vote or if they are credentialed poll watchers, which they weren't. This illegal behavior was repeated at multiple polling places in Houston. Emails contradict Justice Dept. official's sworn testimony. Through a Freedom of Information Act request, Judicial Watch has obtained Justice Department emails that seem to contradict sworn testimony by Thomas Perez, Assistant Attorney General for the Civil Rights Division. In testimony before the U.S. Commission on Civil Rights, Perez asserted that none of Justice's political leadership had anything to do with the in the decision to stop pursuing voter intimidation charges against the New Black Panthers seen standing in front of a polling place in Philadelphia brandishing weapons during the 2008 election. Explosive Justice Department Emails Offer New Evidence. Judicial Watch ... announced today [11/8/2010] that it has obtained documents from the Obama Department of Justice (DOJ) that provide new evidence that top political appointees at the DOJ were intimately involved in the decision to dismiss the voter intimidation case against the New Black Panther Party for Self Defense (NBPP). These new documents, which include internal DOJ email correspondence, directly contradict sworn testimony by Thomas Perez, Assistant Attorney General for the Civil Rights Division, who testified before the U.S. Commission on Civil Rights that no political leadership was involved in the decision. Explosive New Justice Department Black Panther Emails. The Obama Department of Justice (DOJ) cannot shake the New Black Panther Party scandal. Every week new revelations emerge about the racism and political favoritism that are corrupting our nation's top law enforcement agency. Black Ops on Black Panther case. The Justice Department still hasn't explained its decision to drop most of its voter-intimidation case against violent Black Panthers 18 months ago. If the U.S. Commission on Civil Rights finally adopts its report on the controversy, the great lengths Justice officials have taken to avoid scrutiny will be exposed. Exclusive Excerpts From New Black Panther Case Investigation Report. This case was unique in one vital aspect almost from its beginning — the existence of a visual recording of the New Black Panthers in their paramilitary, fascist-style uniforms, one holding a night stick, blocking the entrance to a polling place. That kind of direct evidence is very unusual in a voting rights case. It helped to graphically illustrate the preposterousness of the Obama administration's dismissal of virtually the entire federal lawsuit the Civil Rights Division had commenced against the New Black Panther Party and several of its members. The feeble and completely non-credible explanations for the dismissal advanced by the Department's political leadership only made the matter worse. Pigford and New Black Panthers: Friends at DOJ. At the Justice Department, one man has played a central role in two of the most controversial racialist policies of the Obama Administration — Associate Attorney General Thomas Perrelli. This bundler of huge campaign contributions for the Obama Campaign is now the second highest ranking Presidential appointee at the Justice Department. Perrelli is best known for his central role in dismissing the slam dunk voter intimidation case brought and dropped against the New Black Panther Party. But the leftist Perrelli has outdone himself. No sunlight on Black Panthers. Judicial Watch is exposing the emptiness of open-government promises by President Obama and Attorney General Eric H. Holder Jr. These Democrats have stiffed the legal public-interest group's Freedom of Information requests related to the Justice Department's dismissal of a voter-intimidation case against members of the New Black Panther Party. Judicial Watch's Dec. 7 filings reveal the false basis for the administration's novel claims of "privilege" against disclosure. Obama's see-no-evil, do-nothing Justice Department ignores voting rights. One thing worse than a hypocrite is a hypocrite in government office. The Obama Department of Justice has plenty of hypocrites. Nowhere are they more apparent than when they attack the voting rights record of the Bush Justice Department. Eric Holder's 'Made-Up' Defense. Sometimes politicians make the mistake of listening to their staff at their own peril. Eric Holder is making that mistake when it comes to some of the biggest scandals on his watch, such as the dismissal of the voter intimidation case against the New Black Panther Party. Holder's interview with Charlie Savage of the New York Times shows that he has adopted a dug-in partisan position instead of a cautious and reasoned one. For an attorney general facing increased scrutiny from Congress, this partisan approach is damaging to the Department, and probably to Holder's tenure as attorney general. 'Civil Rights' Gone Wild. The Justice Department's Civil Rights Division has no time to pursue voter-intimidation cases against black defendants. But it has plenty of time to pursue local school boards that make common-sense decisions about student dress codes and accommodations for teachers' religious practices. The contrast between what the division does and doesn't regard as important reveals a radical ideology on the loose — and the willingness of this administration's political appointees to abuse the civil-rights laws they are supposed to enforce. Holder Uses New York Times to Tamper with New Black Panther Investigation. Attorney General Eric Holder recently made statements to the New York Times so detached from reality that they could have been written by scheming Republican operatives for fun. In particular, Holder tells the Times that the lawless dismissal of voter intimidation charges against the New Black Panthers is "a made up controversy." Holder corrupts Black Panther probe. Justice Department whistle-blower J. Christian Adams says Attorney General Eric H. Holder Jr. "tampered" with two ongoing investigations into voter-intimidation by members of the New Black Panther Party. Tampering or not, Mr. Holder clearly prejudiced the case by publicly misrepresenting it. Witching hour for Black Panthers. The Black Panther voter-intimidation scandal is approaching the boiling point on four different burners. Evidence grows that the Justice Department is using illegitimate means to keep a lid on legitimate investigations. Because his department can't be trusted to police itself, Attorney General Eric H. Holder Jr. needs to appoint a special counsel. New Black Panther Party case: The facts are in. The U.S. Commission on Civil Rights came out in December with a draft of its interim report on the New Black Panthers Party scandal. Earlier today a final report was posted on the commission's website, and with it, a flurry of rebuttals and separate statements from a number of the commissioners. The import of these statements should not be minimized. Civil-Rights Commission Report Reveals Racial Double Standard at DOJ. The U.S. Commission on Civil Rights' interim report on the New Black Panther Party voter-intimidation case is now available on the commission's website. ... The bottom line? The evidence shows that a racial double standard prevails in the Civil Rights Division of the Department of Justice. It dismissed the voter intimidation case against the New Black Panther Party because of hostility to the idea of enforcing the Voting Rights Act against black defendants. New Black Panther report released by USCCR. The essentially final report of the United States Commission on Civil Rights about the New Black Panther dismissal is complete. ... The report is large and thorough. I was highly impressed by the writing of Commissioner Gail Heriot. She provides compelling insight on a number of legal and factual issues that I believe nobody has yet provided including me. I am particularly impressed with her writing as a writer, not just as a lawyer. Why the Black Panther Case Matters. Attorney General Eric Holder and his minions, along with some of their slavish apologists in the media, are deliberately trafficking in lies of great note. They prevaricate with great enthusiasm, and they excuse lawlessness with fierce disdain. They — both the Department of Justice (DOJ) officials and their leftist amanuenses pretending to be journalists — brazenly ignore the public's right to information, and intentionally distract attention from relevant facts and from their own deep beliefs. These conclusions arise from the accumulated weight of evidence in what should be a broadening scandal emanating from the infamous New Black Panther Party voter-intimidation case. Foiled FOIAs. Sometimes the word "scandal" gets thrown around too lightly. But when the Department of Justice (DOJ) blocks the public's right to information, blatantly politicizes its practices and appears to break the law, it qualifies as a legitimate scandal. That appears to be the case after revelations yesterday by whistle-blower J. Christian Adams. His report is of concern to press outlets of all ideological stripes (or none) because basic rights of the public and a free press are under assault. Shutting Down the Civil Rights Commission's Investigation of DOJ. For a while, at least, the U.S. Commission on Civil Rights was investigating the Justice Department's race-based decision to dismiss the New Black Panther Party voter-intimidation case — a case DOJ had effectively won. But now President Obama and Harry Reid have used their appointment powers to stop the investigation. They're playing games, literally, in the Justice Department. The Civil Rights Division under the Obama administration has become a prime example of government waste. You are aware of the division's extreme politicization under [Attorney General Eric] Holder, including the outrageous dismissal of the New Black Panther lawsuit after the case had already been won and the money wasted in stonewalling information and witness requests from Congress and the U.S. Civil Rights Commission. ... This is also the same Justice Department division where, during a Voting Section staff meeting called to address chronic tardiness, numerous attorneys demanded permission to arrive at work up to 30 minutes late without penalty. Others wanted to work from home. Eric Holder: Black Panther case focus demeans 'my people'. Attorney General Eric Holder finally got fed up Tuesday [3/1/2011] with claims that the Justice Department went easy in a voting rights case against members of the New Black Panther Party because they are African American. Holder's frustration over the criticism became evident during a House Appropriations subcommittee hearing as Rep. John Culberson (R-Texas) accused the Justice Department of failing to cooperate with a Civil Rights Commission investigation into the handling of the 2008 incident in which Black Panthers in intimidating outfits and wielding a club stood outside a polling place in Philadelphia. Eric Holder's People. The attorney general defends the Justice Department's mishandling of the New Black Panther voter intimidation case in racial terms at the same time he says race had nothing to do with it. 'My People' and the American People Eric Holder Serves. House Republicans need to put another item on their to-do list: ask Attorney General Eric Holder for his resignation ASAP. Two years ago he insulted every American when he called us "a nation of cowards." Yesterday [3/1/2011] in front of a House Appropriations Committee Hearing he all but admitted he's not about to honor the Pledge of Allegiance's promise of "justice for all." Holder brought his $28.2 billion budget request before the lawmakers and got to witness just how willing some people are to have a discussion about race. Bonner: BP spill fund 'a monster' created by Obama Administration. Rep. Jo Bonner (R-Ala.) pleaded with Attorney General Eric Holder Tuesday [3/1/2011] to do all he can to speed up the distribution of funds by the system set up by BP in the wake of the Deepwater Horizon spill last year. Holder ill serves his 'people'. Attorney General Eric H. Holder Jr. played the race card in congressional testimony on Tuesday, referring to blacks as his "people" while neglecting the rest of Americans. That race-based lens pervades his Justice Department, causing consistently skewed enforcement of the law. We, the Unhyphenated Americans. My fellow Americans, who are "your people"? I ask because U.S. attorney general Eric Holder, who is black, used the phrase "my people" in congressional testimony this week. It was an unmistakably color-coded and exclusionary reference intended to deflect criticism of the Obama Justice Department's selective enforcement policies. It backfired. In pandering to skin-deep identity politics and exacerbating race-consciousness, Holder has given the rest of us a golden opportunity to stand up, identify "our people," and show the liberal poseurs what post-racialism really looks like. Eric Holder's liberal racism: Attorney General Eric H. Holder Jr. should resign. He is a disgrace to his office and to his country. ... Mr. Holder is the nation's top law enforcement officer. His duty is to uphold the law and apply it fairly and equally to everyone — regardless of race. In other words, his job demands that he be colorblind. By his own words, he has shown he is unfit for the position. The View from Crackerland. Certainly the recent vexation expressed by Eric Holder over being questioned regarding the New Black Panther voter intimidation case — i.e., his defense of "my people" — depicts a new low in race relations here in America. The liberal media and many politicians are curiously not outraged at what is an arguably race-based federal civil rights case. We were told of a post-racial era that all Americans would enjoy as the outcome of the election of America's first African-American president. As so eloquently described by one of Mr. Holder's people, this post-racial era is not so evident in the view from here in Crackerland. Disregard for Constitution harms the nation. Obama's Attorney General Eric Holder was being quizzed in a congressional subcommittee about his Justice Department failing to prosecute in a voting rights incident involving members of the New Black Panther Party. In 2008, they were standing outside a polling place in Philadelphia, dressed in military fatigues and armed with a club. Their actions plainly appeared to be illegal intimidation of voters in the presidential election that put Obama in the White House. Yet the Obama-Holder Justice Department declined to prosecute in the incident. When Holder was asked about that lack of prosecution, instead of standing firmly with the constitutional right of all Americans to vote without intimidation, Holder, who is black, merely called the incident "inappropriate." Racism or Stupidity. A black or white person, now dead, who lived during the civil rights struggles of the 1930s, '40s or '50s, might very well be appalled and disgusted by black behavior accepted today. Yesteryear, it was the Klan or White Citizens Council who showed up at polling places to intimidate black voters. During the 2008 elections, it was the New Black Panthers who showed up at a Philadelphia polling place to intimidate white voters and tell them, "You are about to be ruled by the black man, cracker." What's worse is the U.S. Department of Justice has decided to not to prosecute. At Justice, It Just Keeps Getting Worse. The Civil Rights Division has blocked a much-needed reform of a local school board in S.C., once again showing it has no interest in protecting minority voters if they are white. The Justice Department Fix Is In. I have learned through sources inside and outside the Department of Justice that the long-awaited internal report on the New Black Panther voter intimidation dismissal is done, and sensible Americans aren't going to be happy. In essence, it will adopt the outrageous position of Attorney General Eric Holder when he testified to Congressman Frank Wolf's Appropriations subcommittee a few weeks ago: all this fuss about the New Black Panther dismissal does a disservice to his people, or to quote the attorney general at the hearing, "my people." ... Americans know a whitewash when they see it, especially a racially unfair one. The Aroma of Illegality. [Scroll down] Obama and Eric "My People" Holder may natter on about "equal protection." That's just talk, though. What they care about is not the 14th Amendment but their political program. Example: if you are a white voter in Philadelphia, you don't get equal protection from armed Black Panthers who strut about polling places. And if some nebbish in the Justice Department who hasn't gotten the message brings a suit against the Panthers, a higher-up (maybe even "My People" Holder himself) can quietly drop the suit when he thinks no one is paying attention. DOJ probe says Panthers case handled appropriately. In a case that has drawn strong criticism from Republican conservatives, the Justice Department's Office of Professional Responsibility has found no evidence that politics played a role when department attorneys dismissed three defendants from a voting rights lawsuit against the New Black Panther Party. Report clears Justice Department in Black Panther case. The probe was an outgrowth of a political controversy over a 2008 voter-intimidation case against members of the New Black Panther Party. Some conservative lawyers, politicians and commentators have said that the Justice Department's Civil Rights Division improperly narrowed that case — part of broader allegations among conservatives that the Obama Justice Department has failed to protect the civil rights of white voters. Attorney General Eric H. Holder Jr. and other Justice officials have strongly denied the charge. Now Congress Steps to the Plate in the New Black Panther Scandal. The Department of Justice has avoided giving Congress and the Commission on Civil Rights answers about the New Black Panther voter intimidation dismissal by pointing to the ongoing review by the Office of Professional Responsibility (OPR). The OPR review is now done and that diversion no longer applies. ... The results were exactly as expected: DOJ concludes that DOJ did nothing wrong. Lack of Black Panther transparency. The Justice Department continues to do its best to whitewash its involvement in the New Black Panther Party voter intimidation case. The department's Office of Professional Responsibility (OPR) wrote Tuesday to House Judiciary Committee Chairman Lamar S. Smith to say it found no "misconduct" in Obama administration political appointees overruling career attorneys in dropping most charges and penalties against the individuals who stood menacingly outside a polling place in military-style uniforms, holding nightsticks. The text of OPR's report, which took 19 months to complete, remains under wraps. That's not surprising considering the office has long been a hotbed for liberal attorneys. Panthers Before Breakfast? Think about it this way: Politicized appointees reviewing politicized appointees determined that no political shenanigans occurred. It's as if an NBA team were asked to call fouls on itself and, lo and behold, made not a single call. The public surely wouldn't accept such an arrangement in basketball — and Congress, acting on behalf of the public, shouldn't accept it in the Black Panther case, either. Top 10 Reasons Eric Holder Should Not Be Attorney General. [#7] Voter intimidation case dropped: The best example of Holder's double standard on racial issues is the Justice Department's handling of the New Black Panthers Party voter intimidation case, where two members of the group stood outside a Philadelphia polling area in paramilitary uniforms, shouting racial insults at whites. When asked why Justice dropped the case, Holder told a congressional panel, "When you compare what people endured in the South in the '60s to try to get the right to vote for African-Americans, to compare what people subjected to that with what happened in Philadelphia ... I think does a great disservice to people who put their lives on the line for my people." New Black Panthers to protest 'non-blacks'. The New Black Panther Party — an organization known largely for their intimidation of voters outside a Philadelphia precinct — has announced plans for a "National Day of Action and Unity," — ironically urging followers (on their day of unity) to boycott all "non-black business" on April 23. The Justice Department's unwatched revolving door. The Justice Department's Civil-Rights Division has hired dozens of Democratic-affiliated lawyers from organizations that have a huge financial stake in the agency's decisions and policies. New Court Ruling in Black Panther Scandal. Judicial Watch earned a victory in court on August 4 in its pursuit of documents related to the Obama administration's Black Panther scandal. ... According to a DOJ document previously produced to Judicial Watch, top political appointees at the DOJ were involved in the decision to dismiss its voting rights case against the New Black Panther Party, including Associate Attorney General Thomas Perrelli, the third highest ranking official at the Obama DOJ. Obama's New Black Panther Problem. Anything portraying Obama in a unfair light is ignored and the motives of those noting it is impugned. ... Today's revelations by [Andrew] Brietbart and the forthcoming book by [J. Christian] Adams likely won't be going down any media memory holes. They'll just ignore the story entirely. Obama Evoked Tenets of Black Liberation Theology in Selma. Observers have speculated on Obama's connection to black liberation theology since Reverend Wright came on the scene, but Shabazz is one more voice confirming that Obama does have an affinity for that viewpoint or, at the very least, understands it well enough to give a convincing sermon based on its tenets — one understood by its audience as such. Who Is the New Black Panther Party? If there was a 4th of July event and the Ku Klux Klan were given a speaker's slot, would any GOP candidate be stupid enough to speak there? Why, then, is it acceptable to Media Matters for Obama and other Democrats to have spoken and marched with the Panthers? Media Matters refers to the 'fable' of the New Black Panther Party, but they don't tell their readers anything at all about the New Black Panthers. In fact, they don't seem to be critical of the New Black Panther Party in any way. So, who is the New Black Panther Party? Did Media Matters Collude With DOJ On Black Panther Story? When news broke of alleged voter intimidation involving the New Black Panthers Party in the 2008 election, Media Matters for America (MMfA) launched a relentless push back against the charges, resulting in almost 8,000 MMfA site specific Google hits in which MMfA attacked virtually anyone who attempted to report on the controversy, while elevating any reporting that minimized it, or the Department of Justice's decision to drop the case. New Black Panther Party President Admits to Philadelphia Voter Intimidation. The Justice Department has seen fit to drop voter intimidation charges against Malik Shabazz' New Black Panther Party's involvement in the now infamous events at a polling place in Philadelphia on November 4, 2008. In light of the recent testimony by former DOJ attorney J. Christian Adams before the U.S. Civil Rights Commission, the story is gaining further attention and scrutiny. Candidate Obama Appeared And Marched With New Black Panther Party in 2007. New photographs obtained exclusively by BigGovernment.com reveal that Barack Obama appeared and marched with members of the New Black Panther Party as he campaigned for president in Selma, Alabama in March 2007. The photographs, captured from a Flickr photo-sharing account before it was scrubbed, are the latest evidence of the mainstream media's failure to examine Obama's extremist ties and radical roots. Breitbart connects Obama to New Black Panther Party. Internet provocateur Andrew Breitbart has photographic evidence of then-Senator Barack Obama sharing a stage in 2007 with Malik Shabazz, National Chairman of the New Black Panther Party, a revival of the militant black supremacist organization founded in 1966 by a couple of thugs named Huey Newton and Bobby Seale. Pay No Attention to Obama Marching With the New Black Panthers. President Obama has been exposed, again, for his radical roots, but by all means, let's continue to accuse the tea party of racism with no evidence. 'Don't Let Fox News Find Out!'. Flashback to November 2, 2008. Remember this guy? If you don't, that is King Samir Shabazz, a member of the New Black Panther Party. He, along with fellow NBPPer Jerry Jackson, were accused of old-fashioned voter intimidation at a Philadelphia polling place on Election Day 2008. After the election, the Justice Department brought a voter-intimidation case against the NBPP and that's where J. Christian Adams comes in. Adams and his DoJ colleagues began building the case but, before they could collect enough evidence, the superiors in the Justice Department told he and his colleagues to drop the case. The New Black Panther Party Case, the Racial Double Standard, And the Rule of Law. The Nation reported yesterday [10/4/2011] that President Obama has dispatched the Department of Justice to investigate states that have enacted voter ID laws. ... This is the same Department of Justice that abandoned the open-and-shut case against the New Black Panther Party for voter intimidation. New Black Panthers Bring Racism to the Mainstream Media's Clubhouse. On Friday, September 23, 2011, at the National Press Club in Washington, DC, a panel of activists held a press conference on the $2.7 billion Pigford settlement between the U.S. Department of Agriculture (USDA) and black farmers claiming past discrimination. What ensued was a grotesque display of racism, antisemitism, and homophobia. And not a single member of the mainstream media was on hand to report what happened. The event was opened by Malik Zulu Shabazz, Chairman of the New Black Panther Party, a militant hate group that supported Barack Obama in the 2008 election and sent armed thugs to intimidate voters at several polling places in 2008 and 2010. Obama's Greatest Failing. The sad truth is that our president has flunked every racial test he has taken — from his ineptly criticizing the Cambridge police for their alleged stupid handling of a complaint by a prestigious black Harvard professor to his embrace — yes, an actual hug — of the clever racial bigot, Al Sharpton. Obama has had many opportunities to use the bully pulpit of the White House to denounce bigots like Sharpton and his brother-in-hate, Farrakhan, but he has not done so. Just the opposite. Anti-white and anti-Semitic thugs are flourishing in this spineless atmosphere — even though we Americans had every right to expect Mr. Obama to deal with them harshly. All of which brings us back to the New Black Panther case. The truth behind Holder's push for 'electoral equality'. As for Holder, his role as champion of electoral fairness is embarrassingly unilateral. He was far less protective of "the franchise" in his early days at Justice where one of his first acts was to dismiss out of hand a civil suit against two men accused of voter intimidation. Although the attorney general refuted claims that his decision was based on skin color — both men were members of the New Black Panther party — a former assistant AG swore the move was motivated purely by race, possibly with input from the White House. Friends in High Places. [Lamar Smith and Frank Wolf], who just this week fired off two-dozen questions to Attorney General Eric Holder, continue to pursue the case, but without Democratic support they cannot subpoena either witnesses or documents. That may change after the November election. If the House of Representatives or Senate flips to Republican control and new committee chairmen decide to engage in actual oversight, Perrelli and Holder may find themselves forced by subpoenas to tell the complete NBPP story and explain why Obama's Justice Department believes the civil rights laws exist only to protect citizens of certain races.